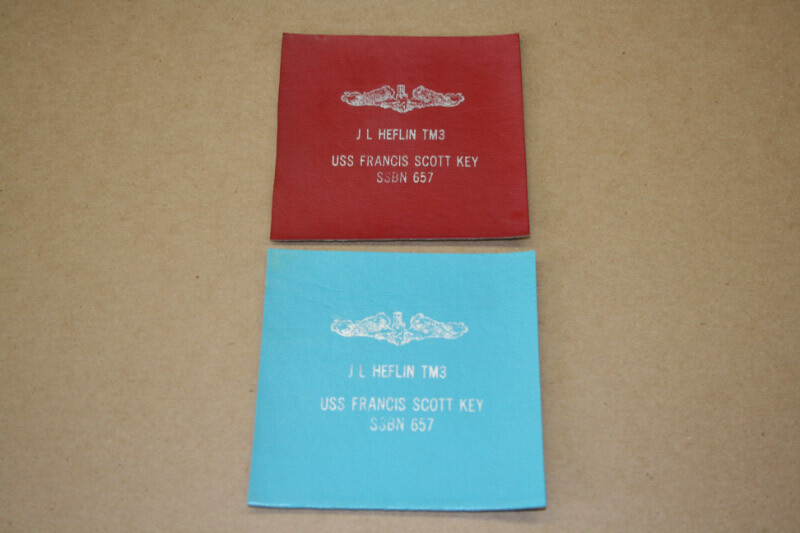 Throughout our time on the Key, there were many documents and souvenirs, that passed through our hands. 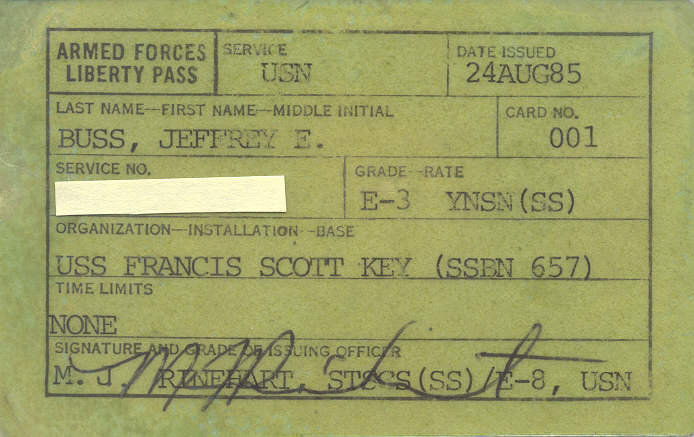 I thought it would be appropriate to try to save some of these images to document our lives on the Key. 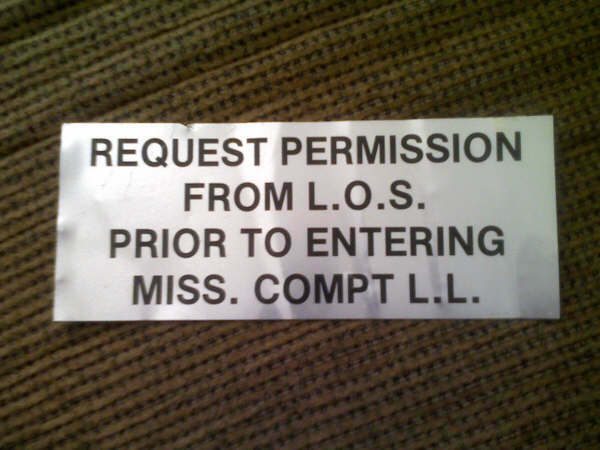 Some examples might be: liberty passes, Qual cards, meal passes, official letters, announcements, family grams, items that followed you home, etc. 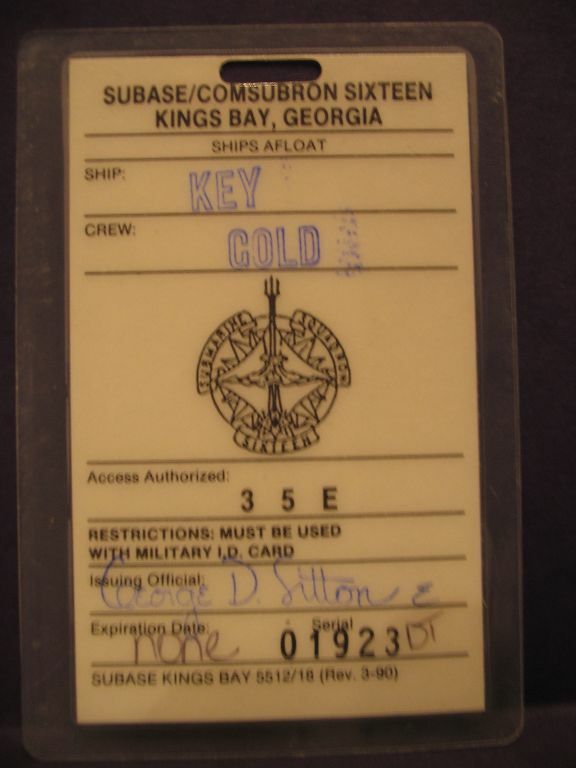 Anything that would help us document life on the Key. 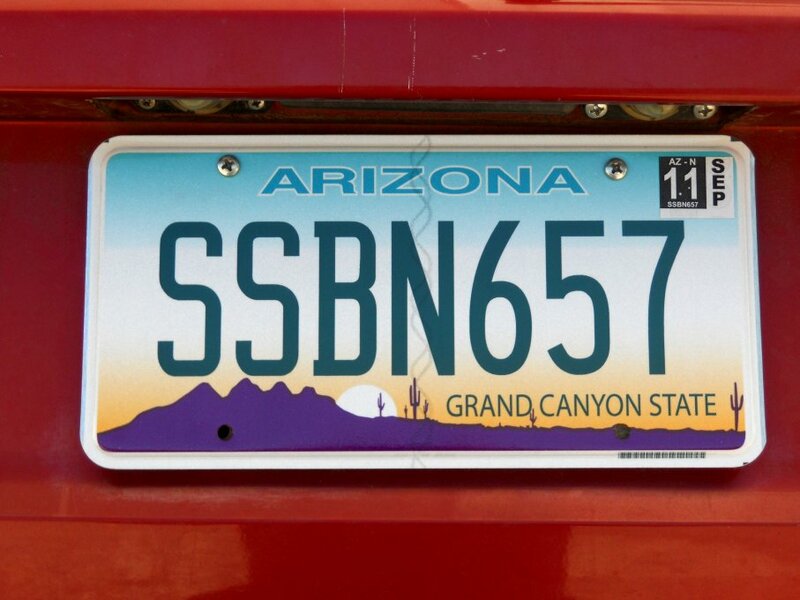 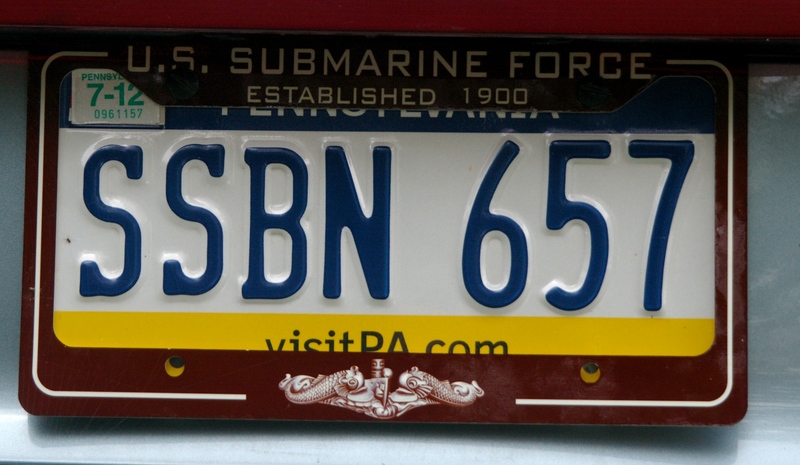 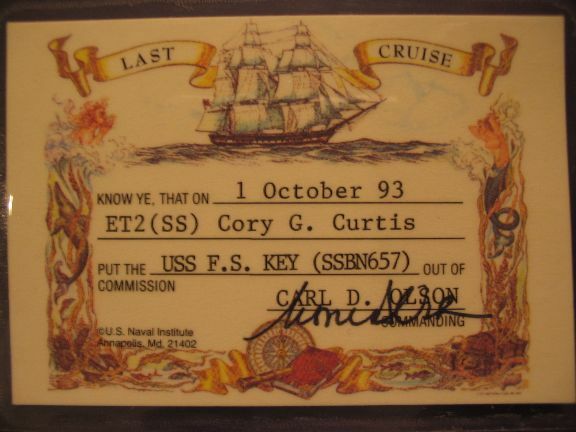 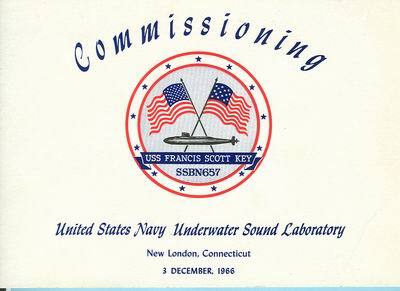 E-mail your Key papers to ssbn657@comcast.net. 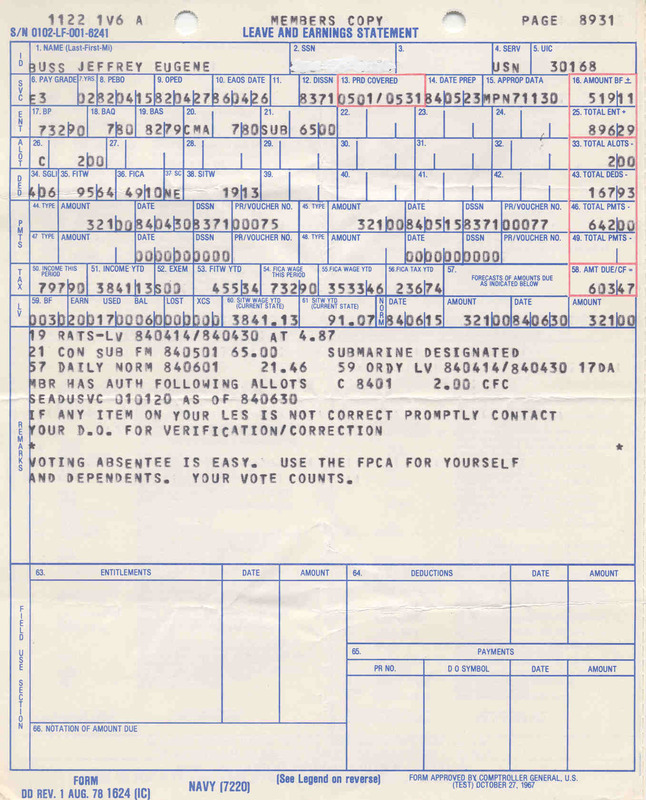 If you do not have access to a scanner, e-mail me and I'll send you a fax number to send copies of the documents and I will scan them. 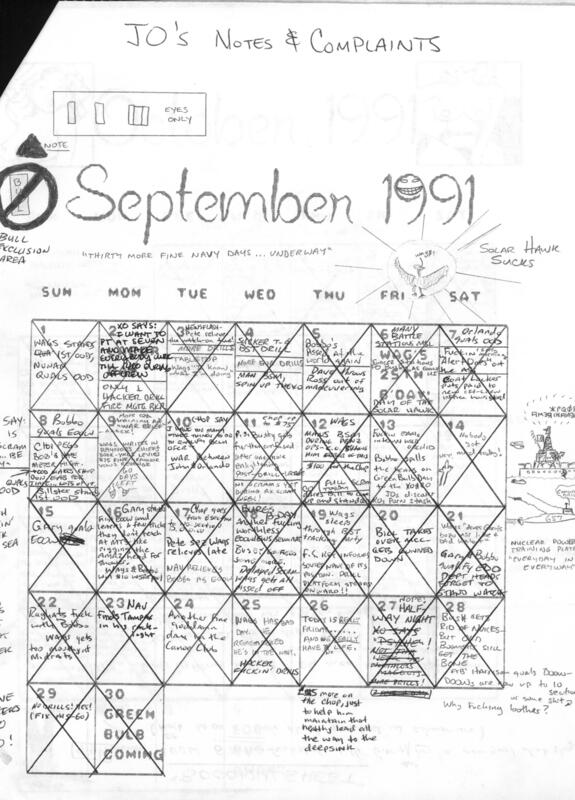 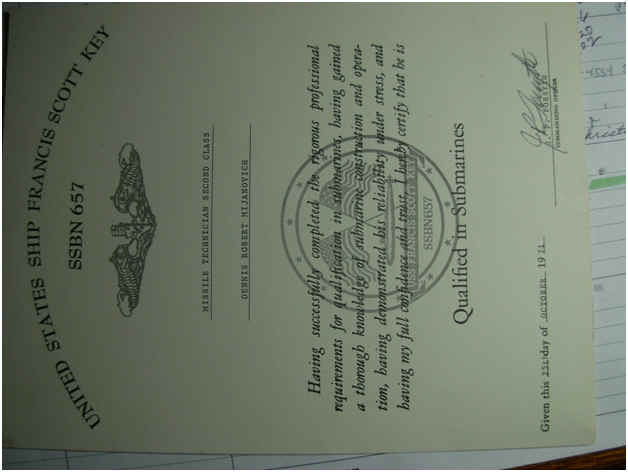 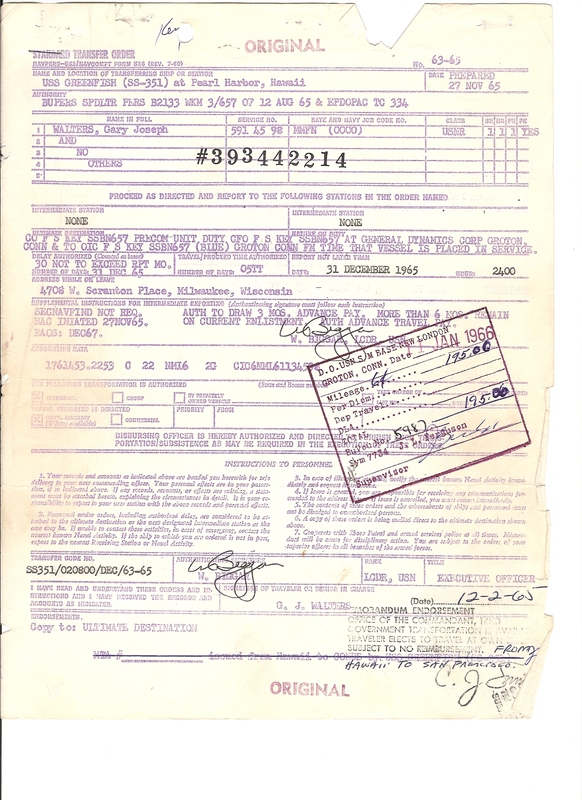 Below are thumbnails of the documents. 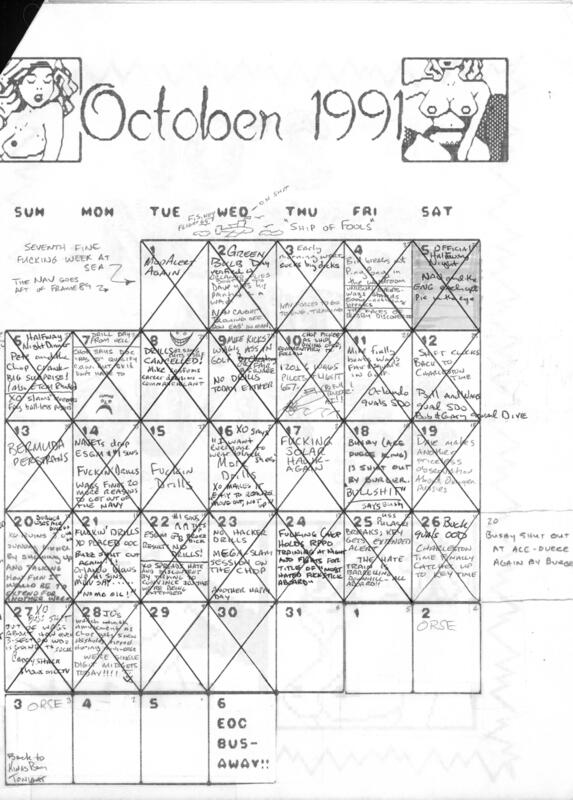 Click on them for a larger version. 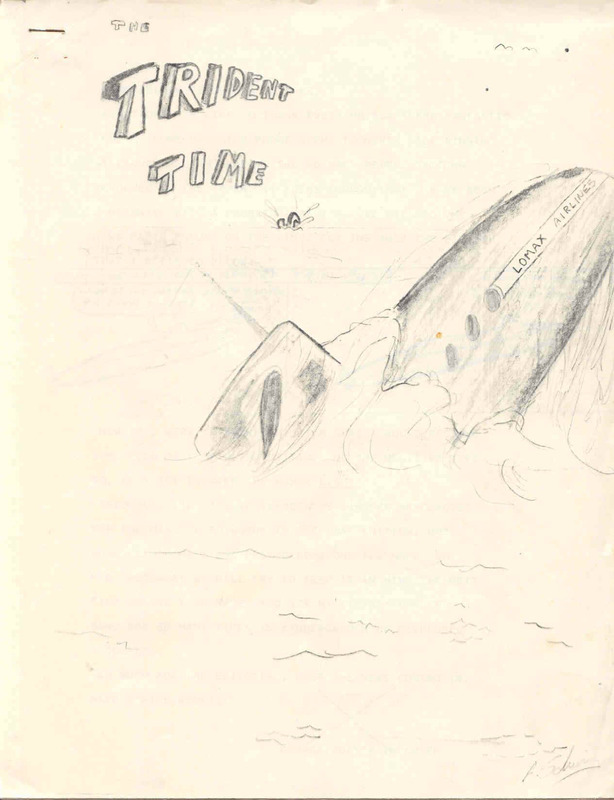 The Garboon Tribune ships newspaper. 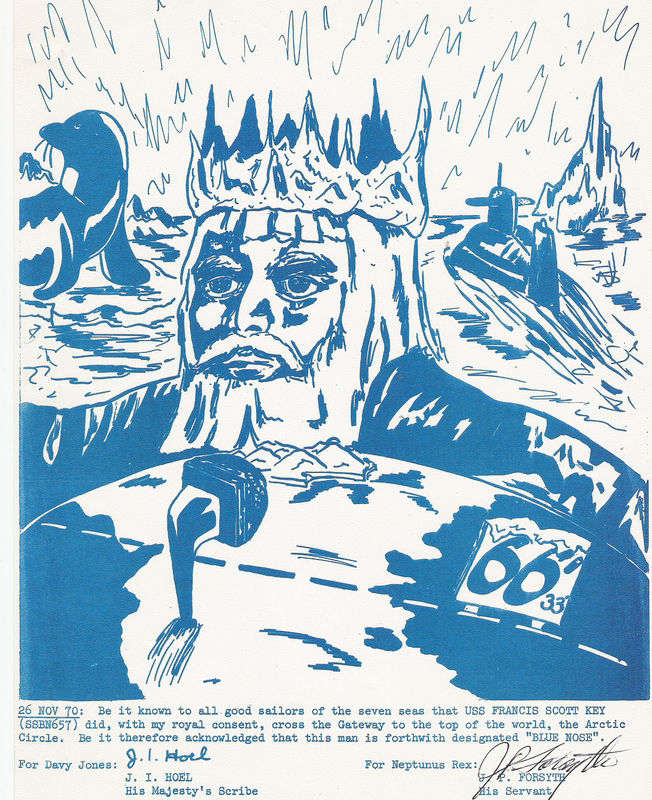 Click here for entire issue. 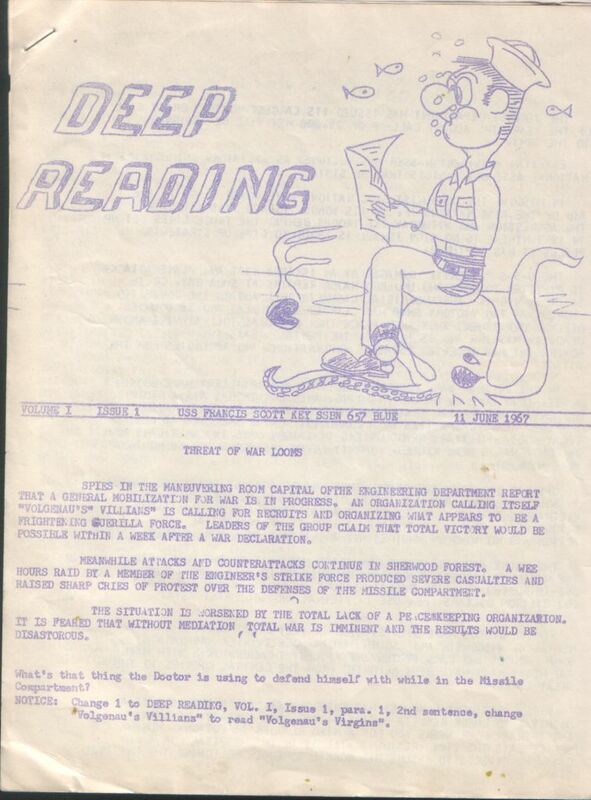 I was recently sent about a dozen past issues. 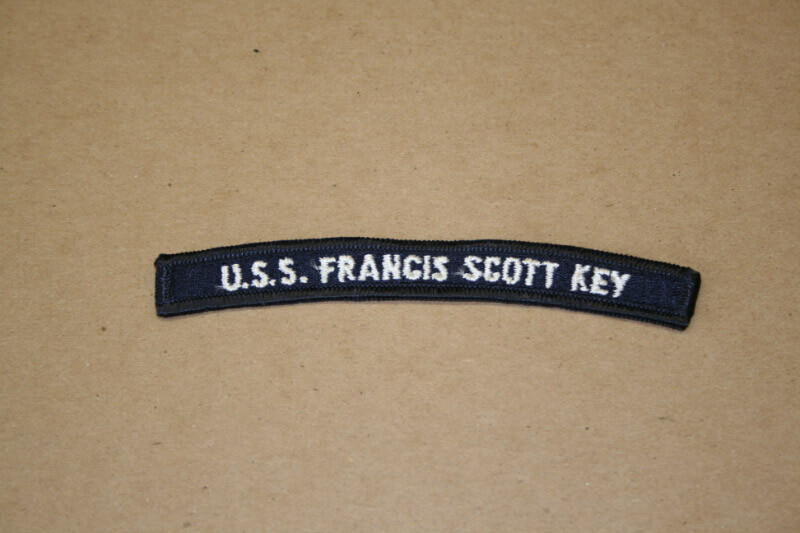 I'll try to get them online soon. 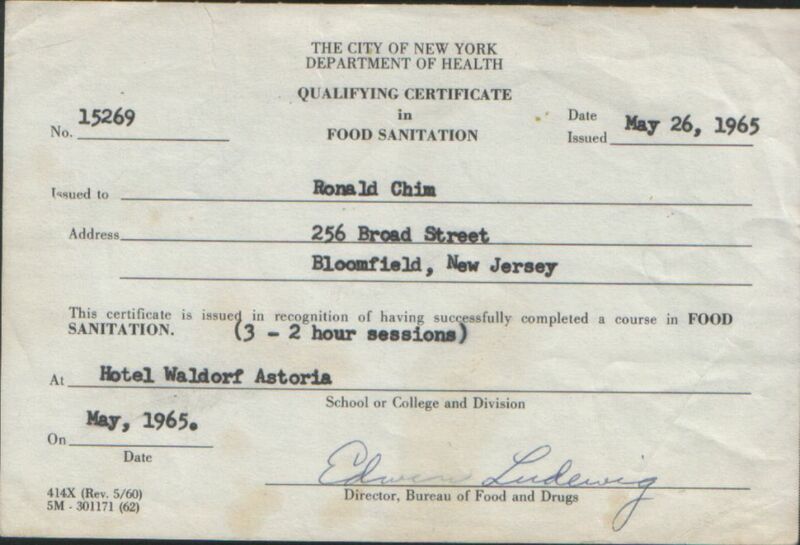 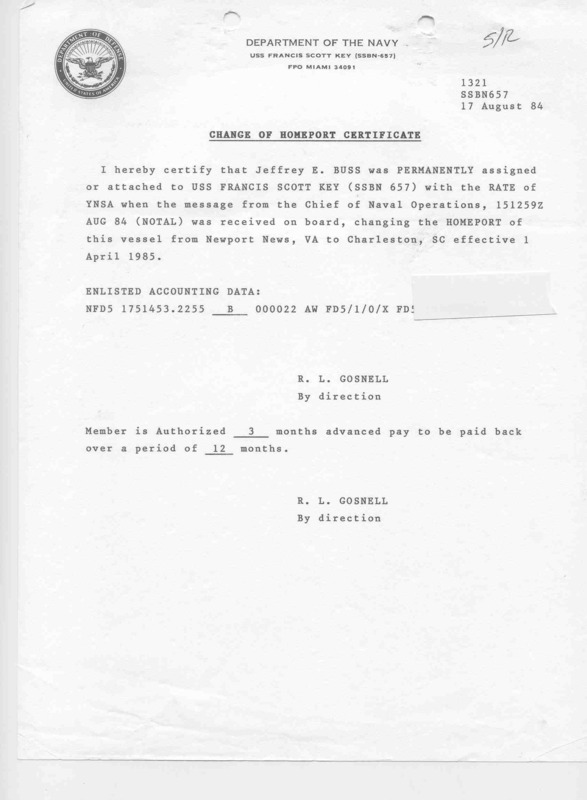 Pay record. 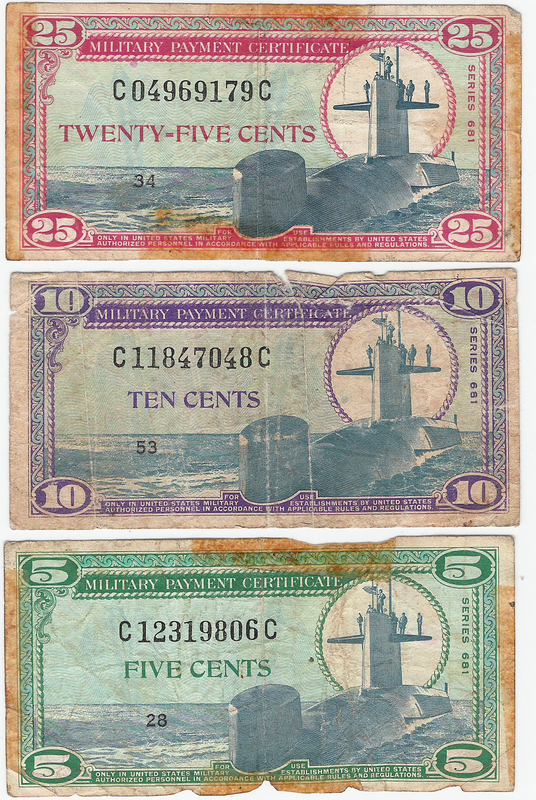 Weren't we overpaid? 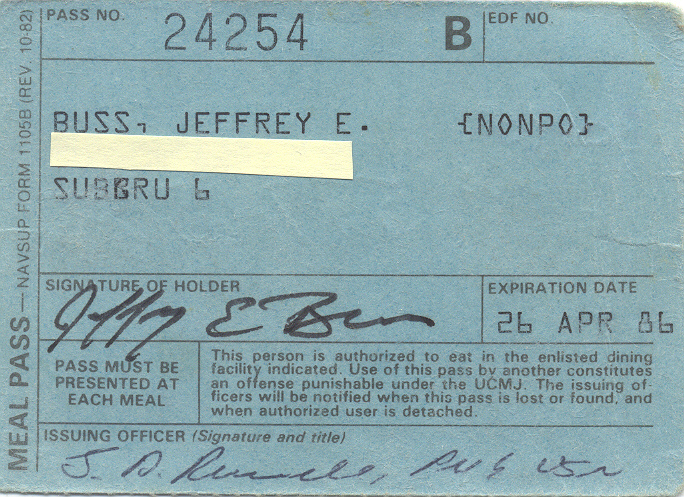 I'd do it again for free - well almost. 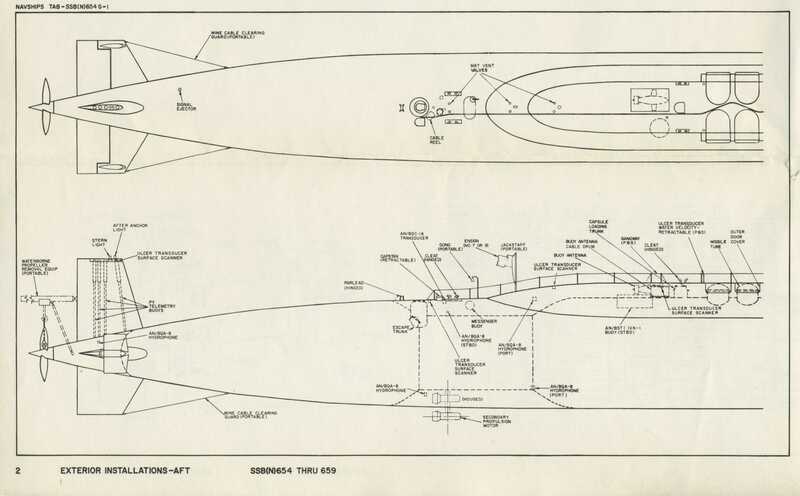 So that's how it works. 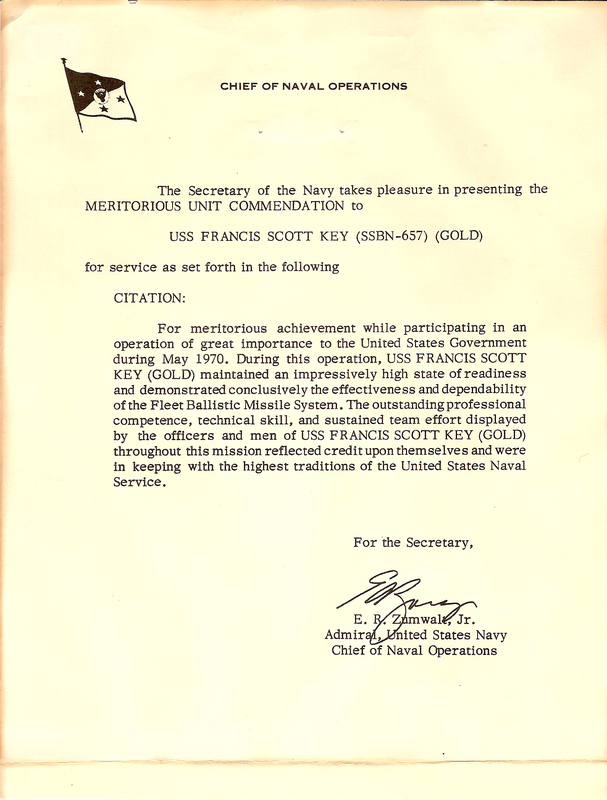 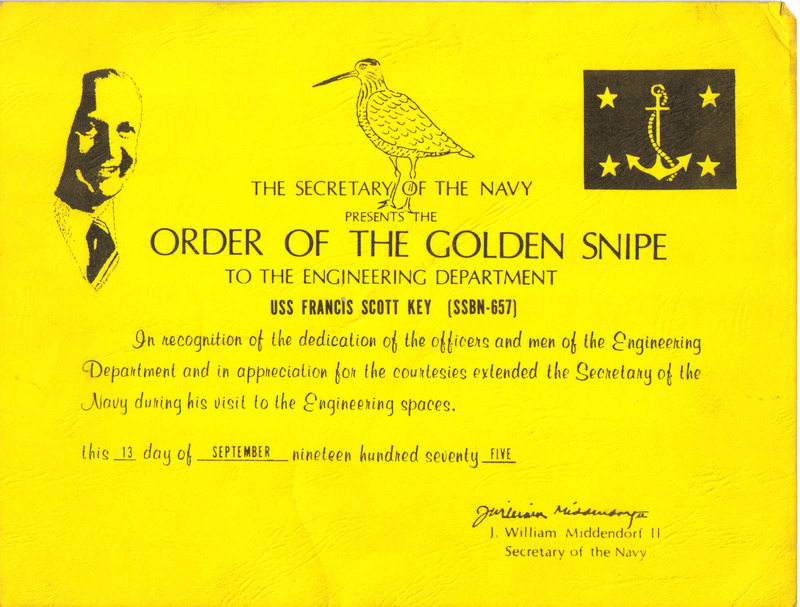 A handout of the Key's systems. 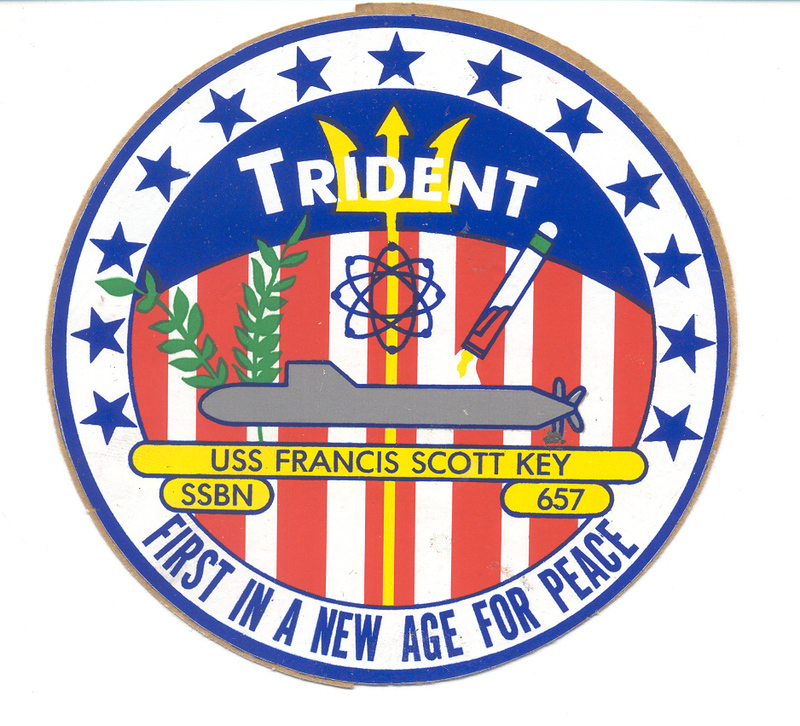 The Key launched the first Trident and this bumper sticker let the crew brag a bit. 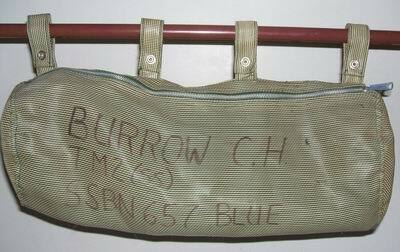 Laundry bag. 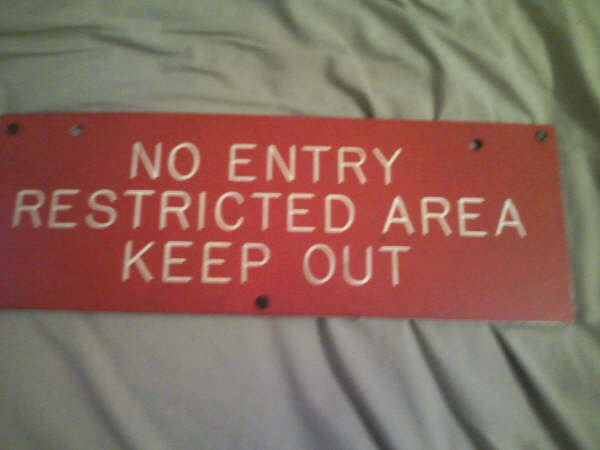 Wasn't that a fun thing to try to do. 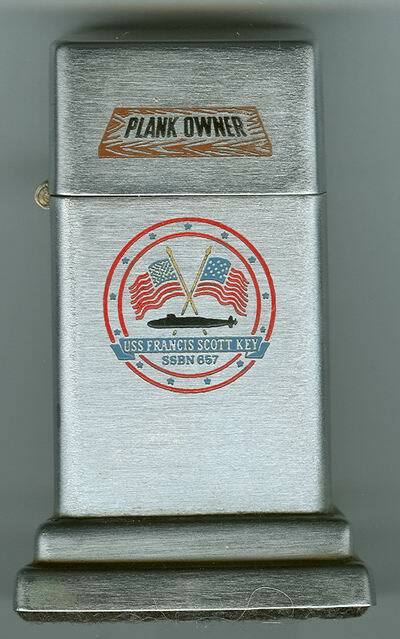 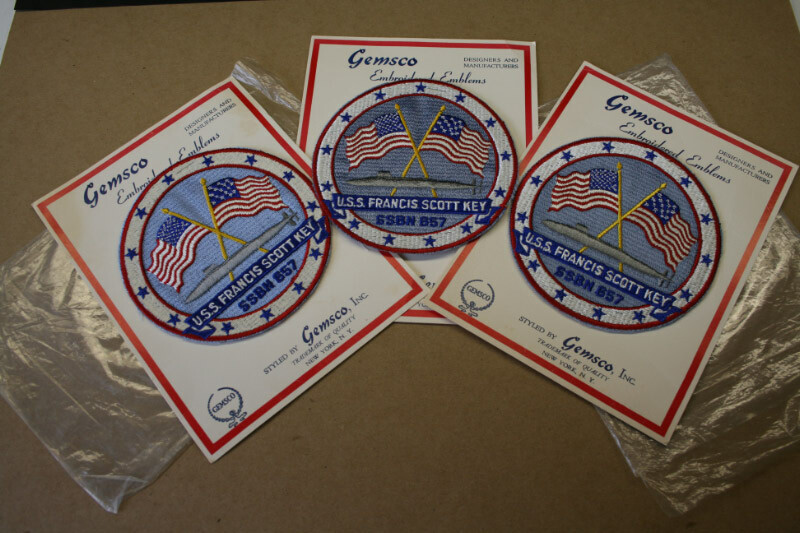 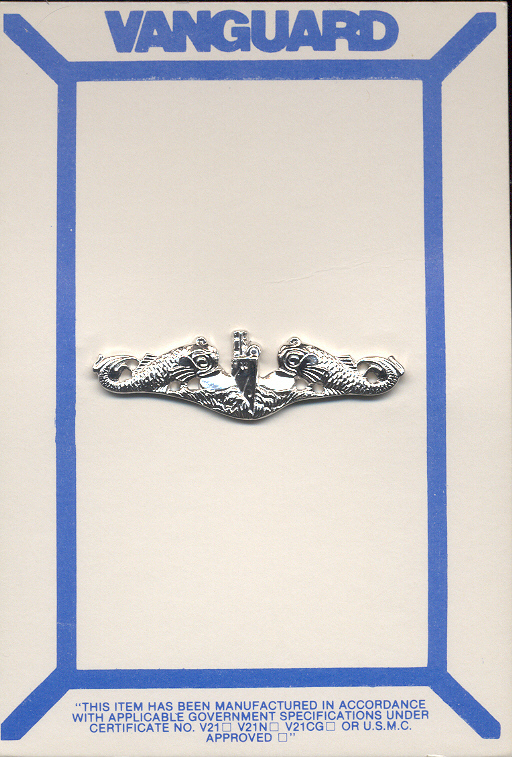 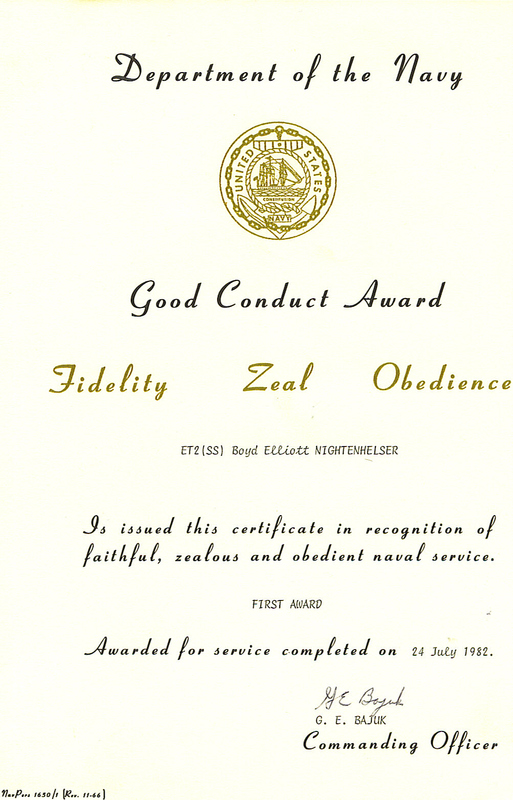 Given to each commissioning crew member. 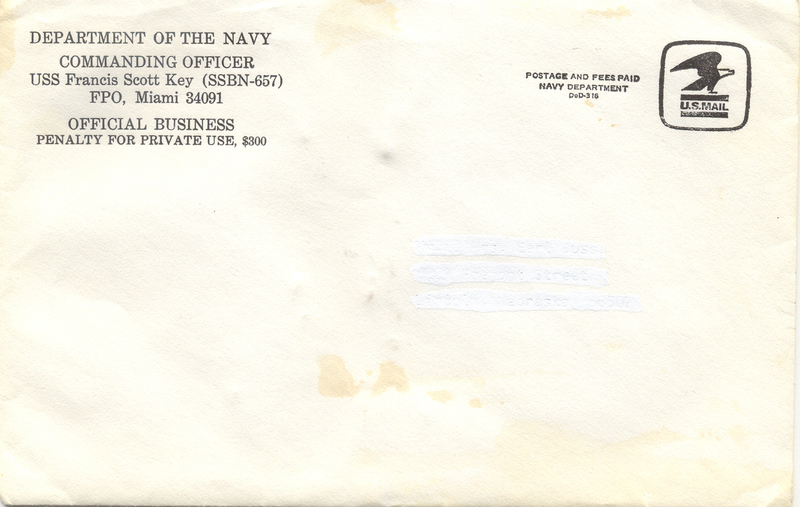 Commissioning envelope issued the day the Key was commissioned. 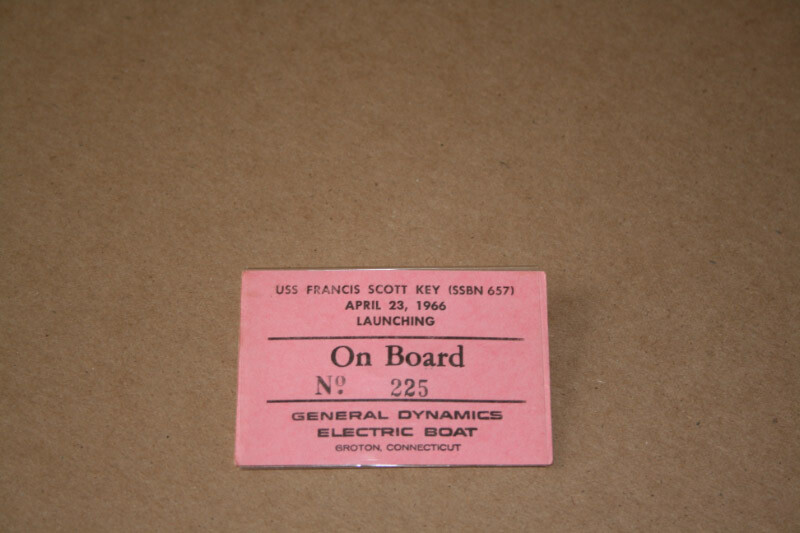 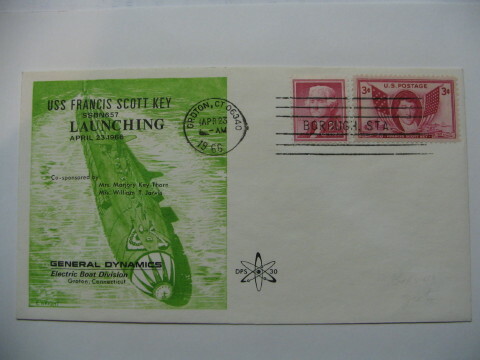 Launching announcement envelope issued the day Key was launched. 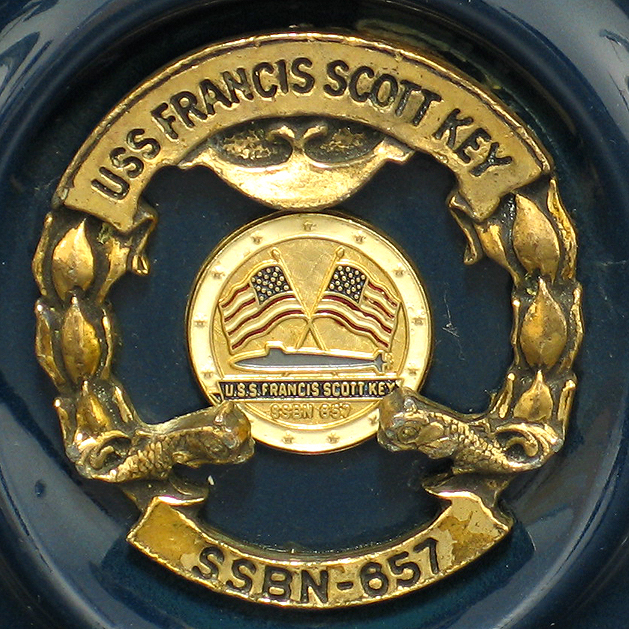 Key ship's bell close up. 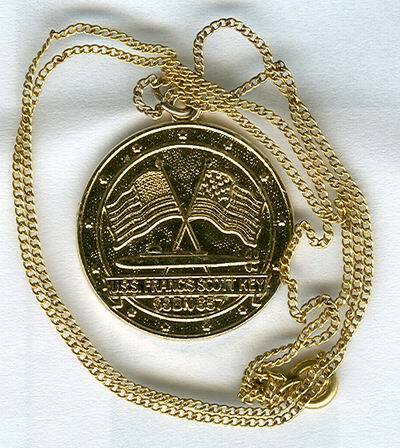 Submitted by John Zlotucha, Gold crew 67 - 71. 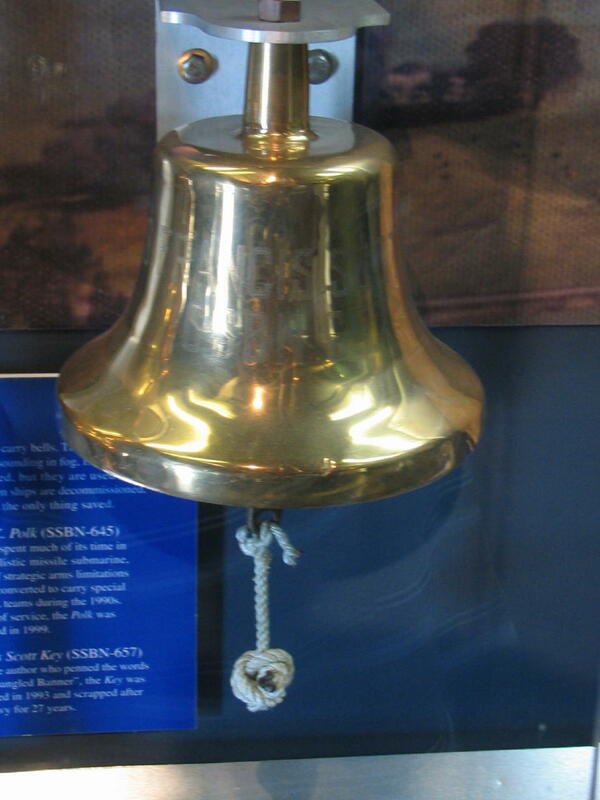 Sign at Sub Museum by ship's bell. 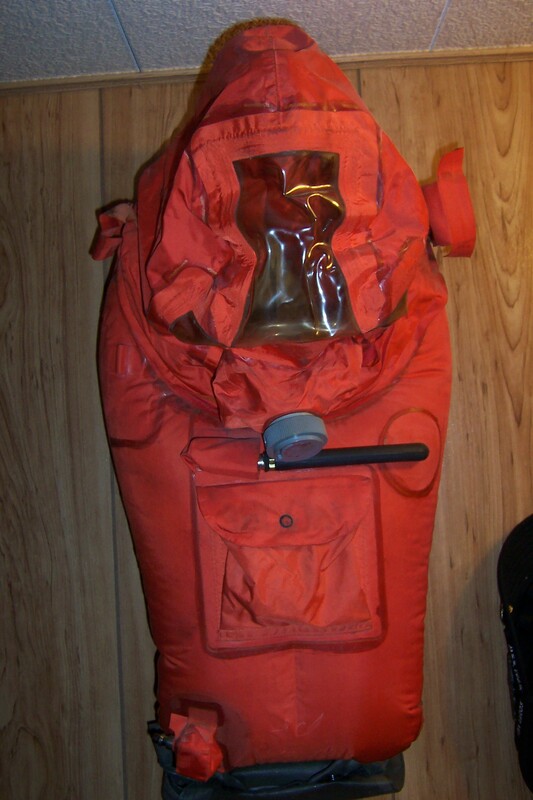 Hope you never needed one of these - Stenke Hood. 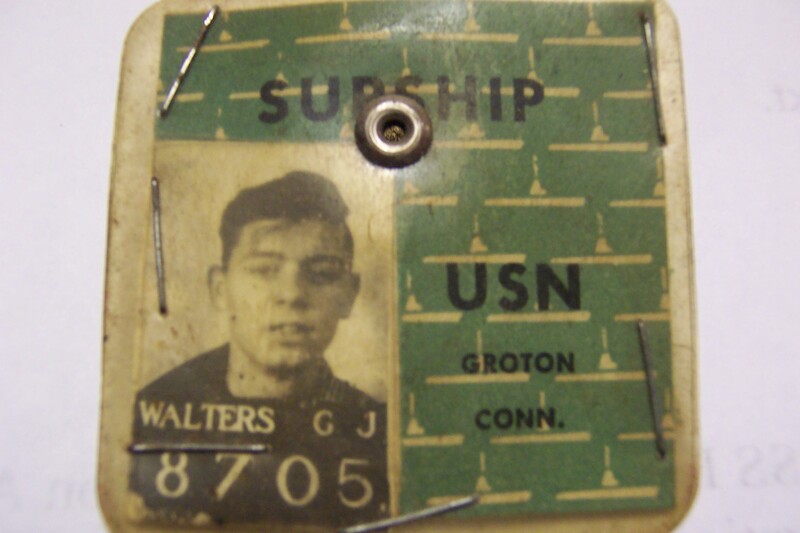 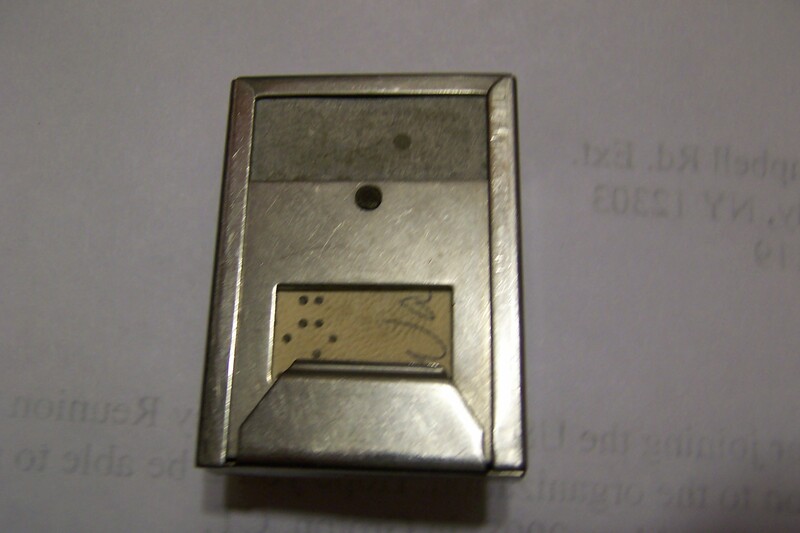 Gary Walters EB access badge used during the Keys construction. 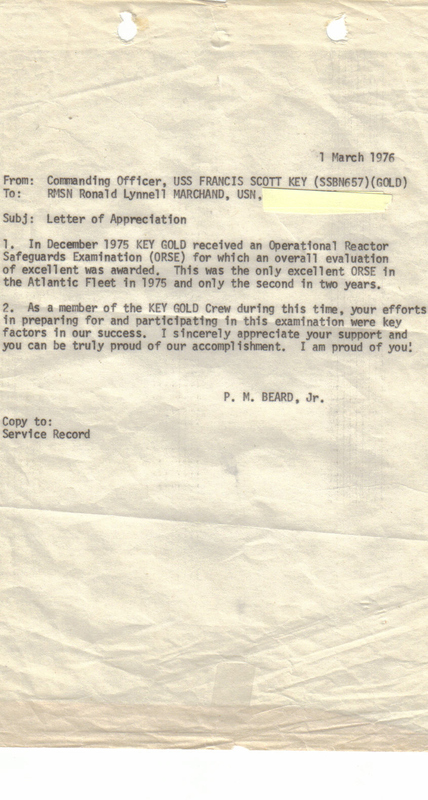 Gold Crew Officers Roster with Key history to date. 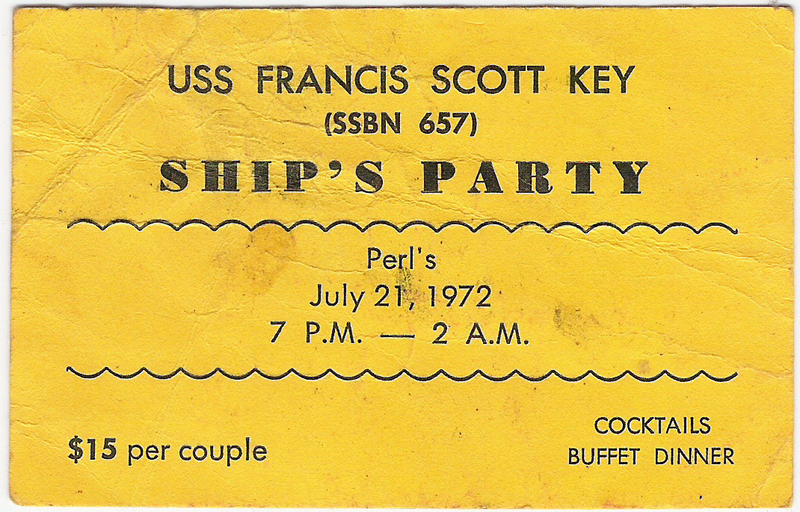 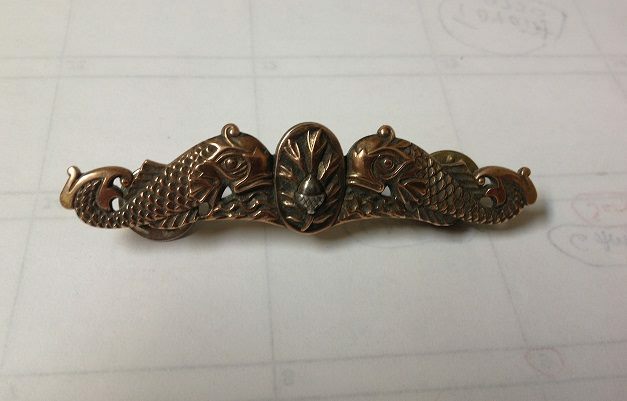 Key belt buckle submitted by Mark Swarthout a midshipman who took a two-day tour on the Key in 1978. 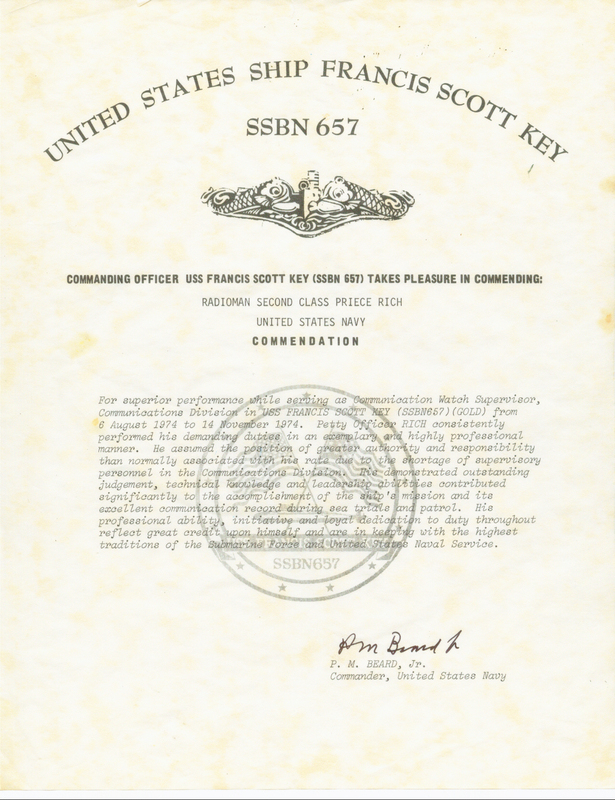 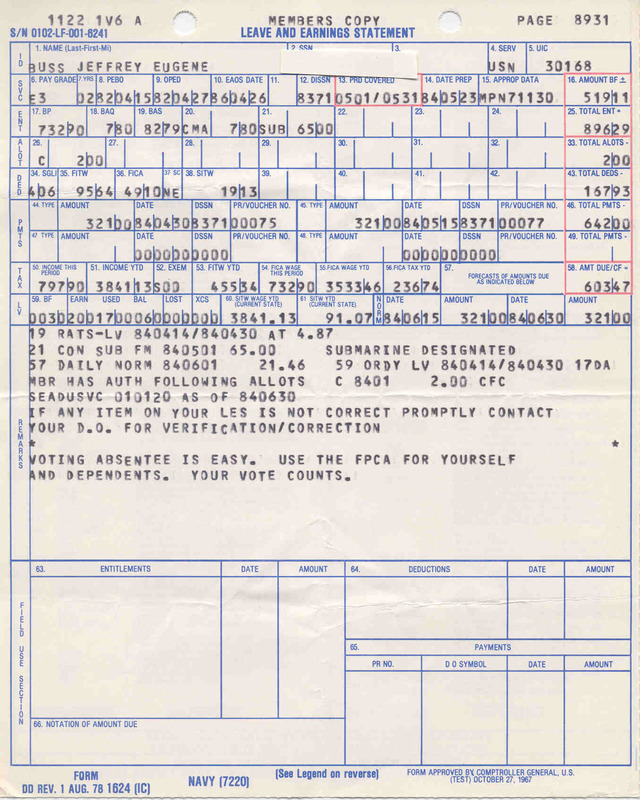 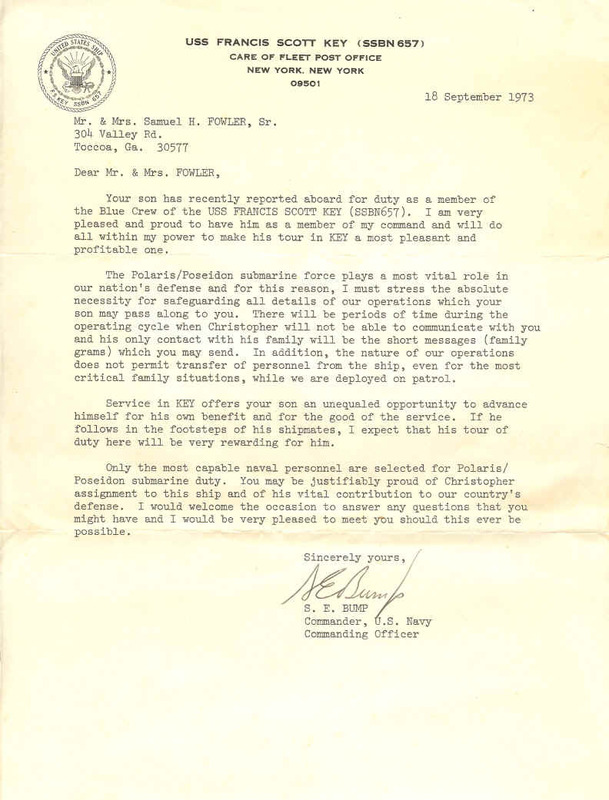 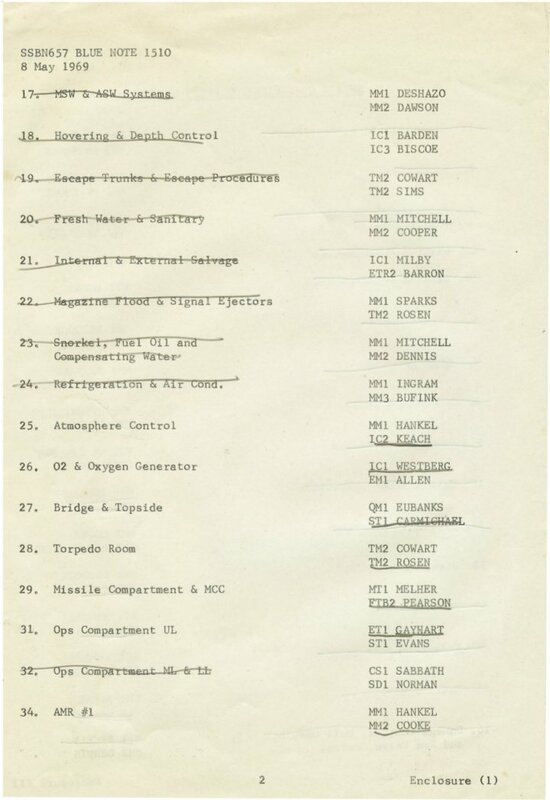 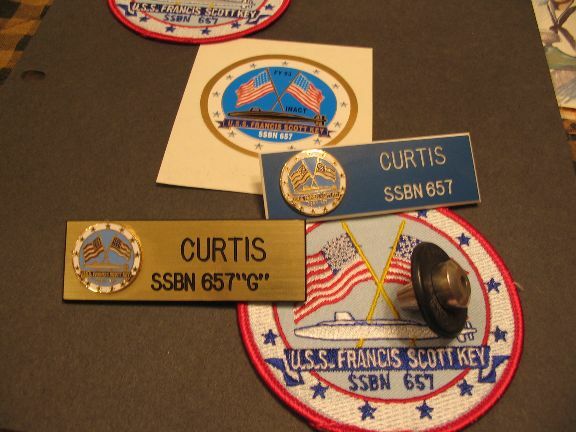 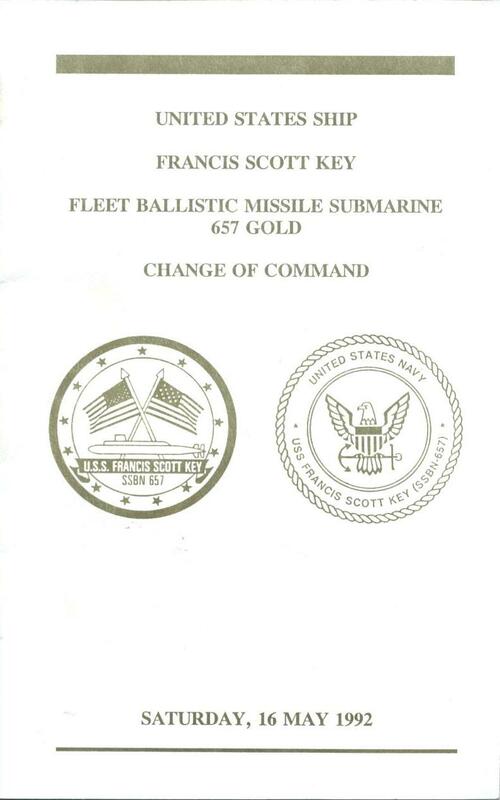 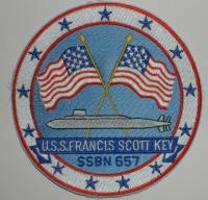 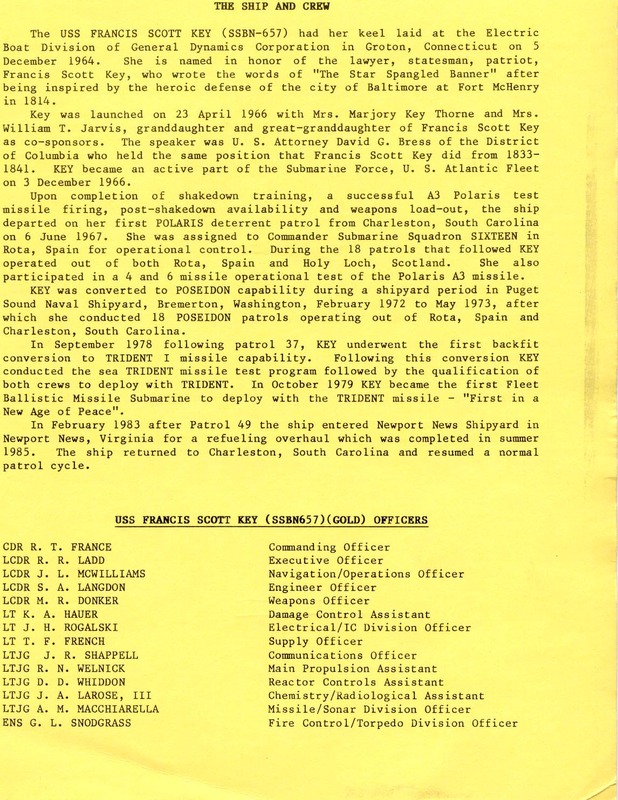 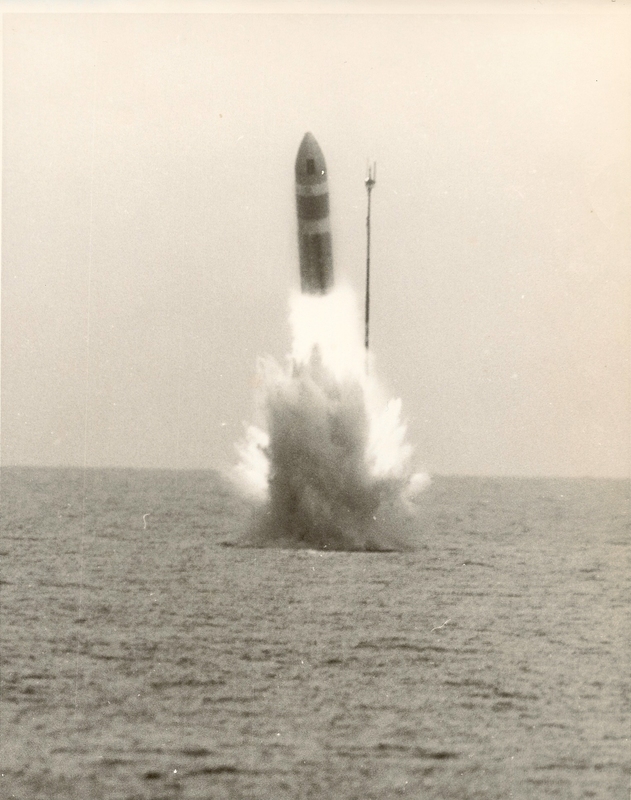 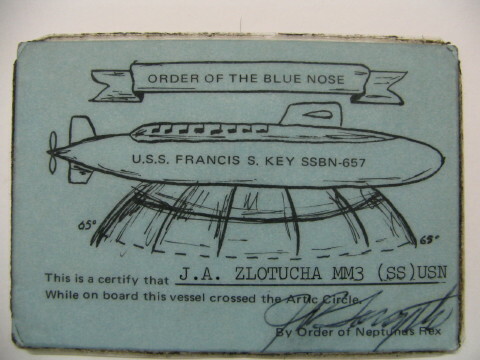 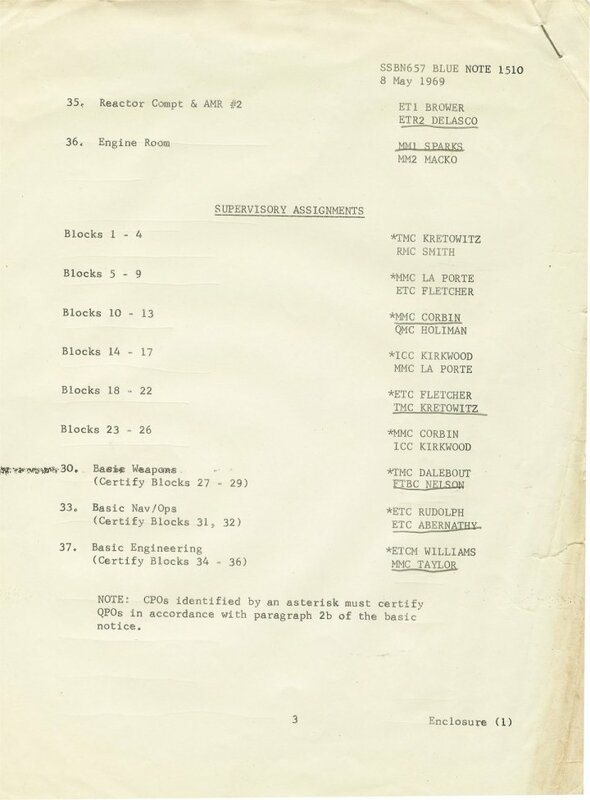 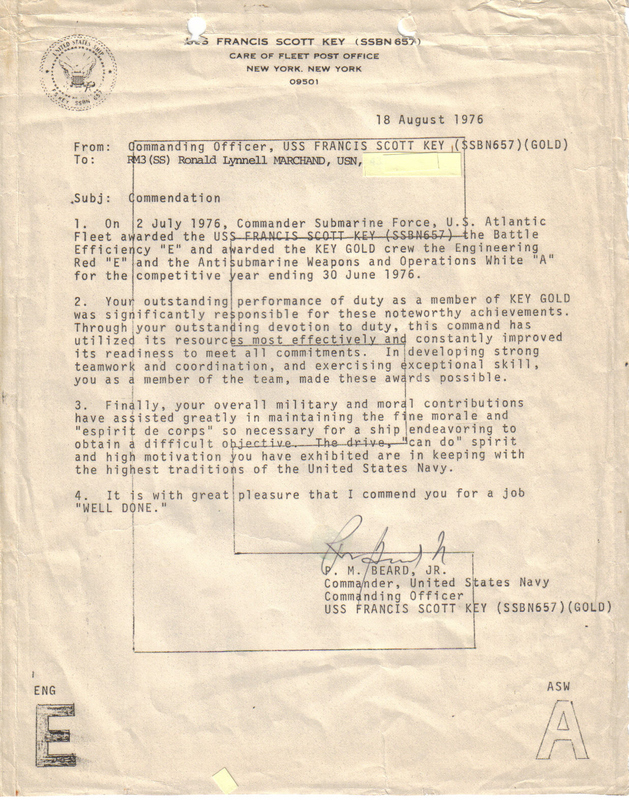 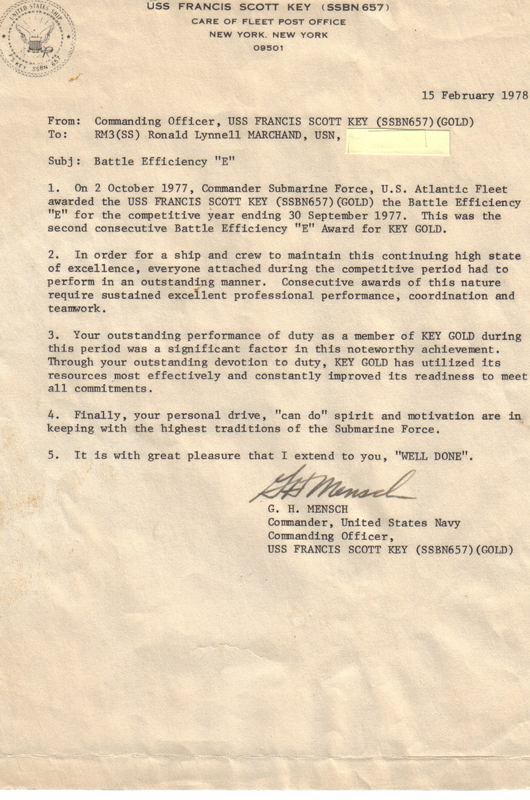 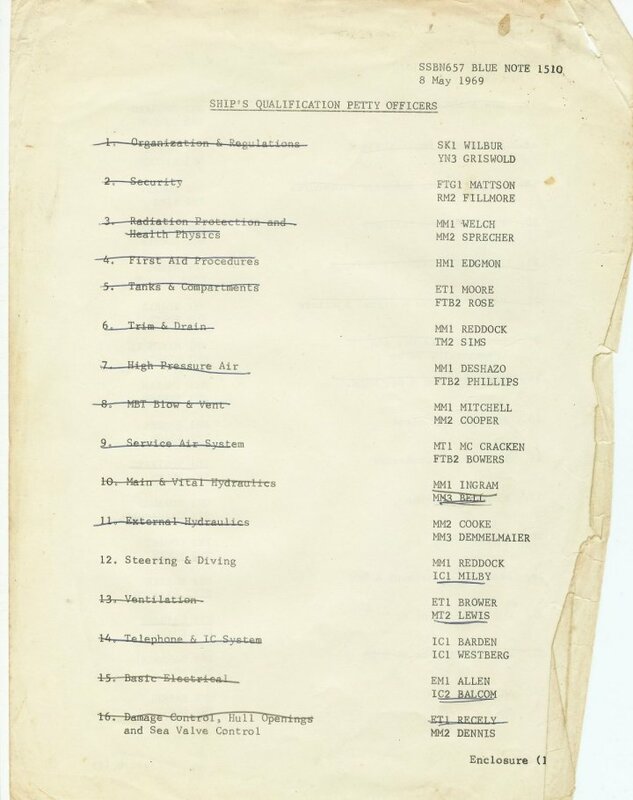 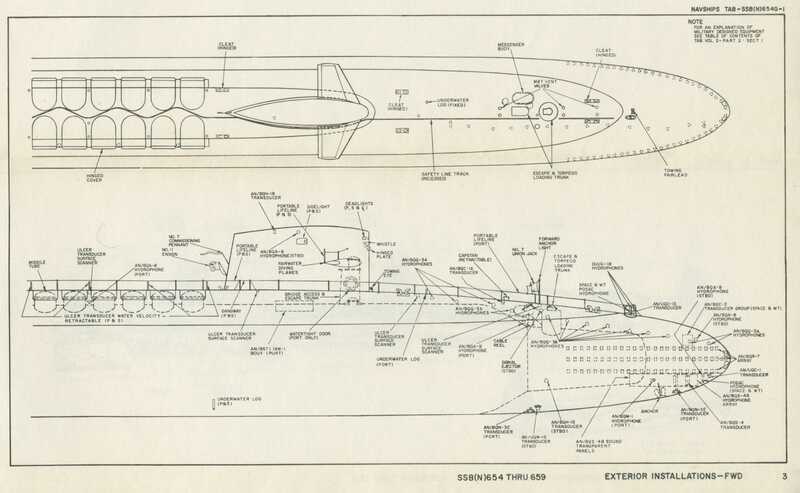 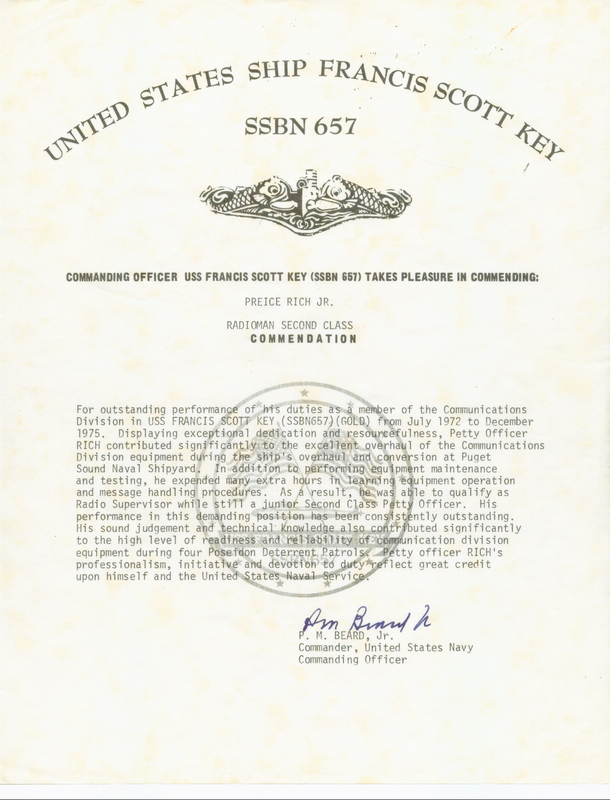 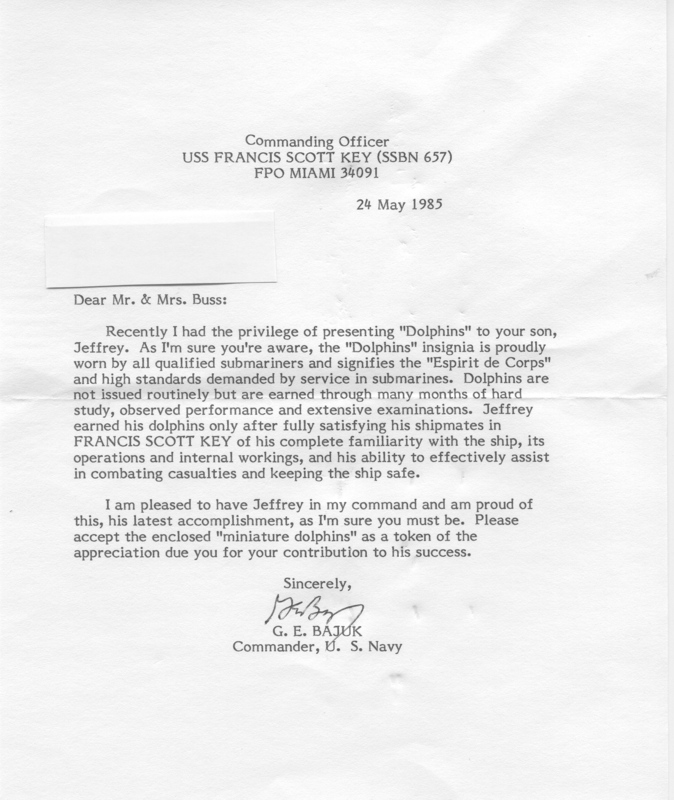 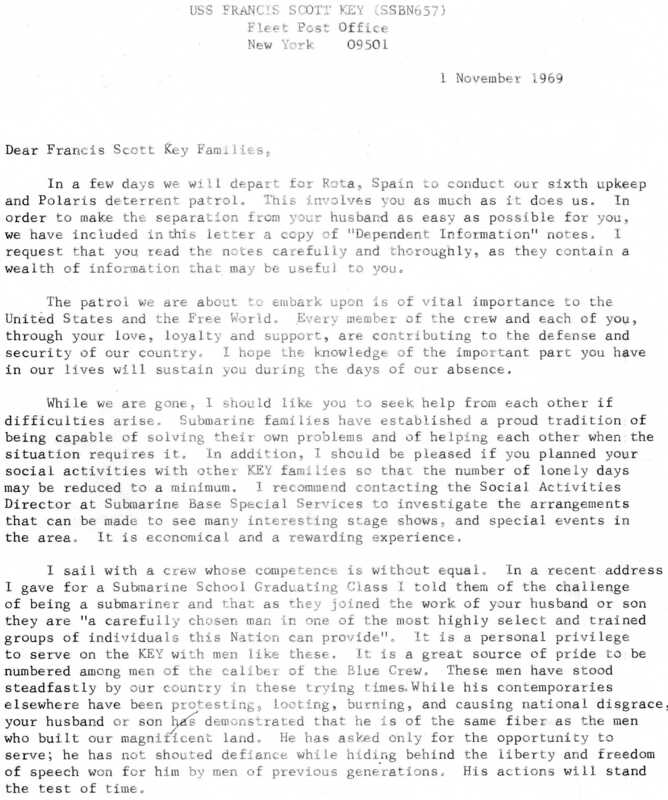 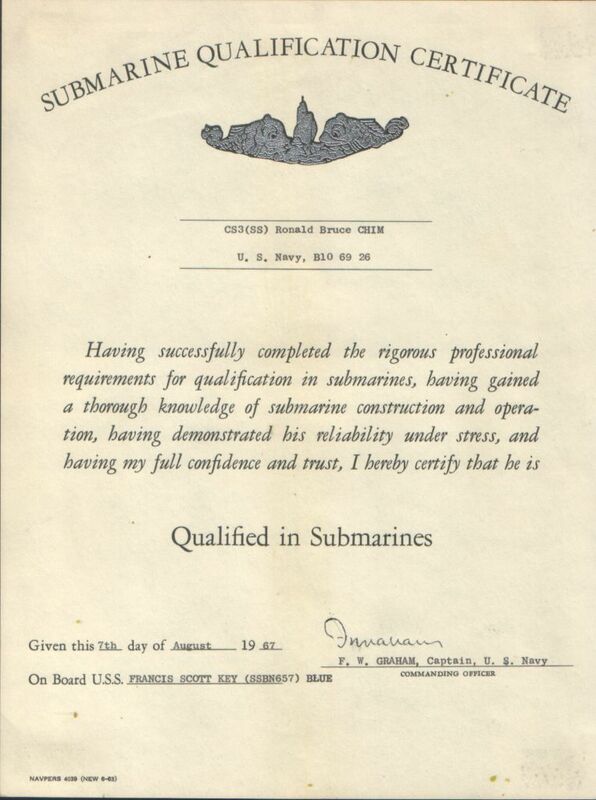 Gary Walters: Here is a copy of my original orders to the Key SSBN 657. 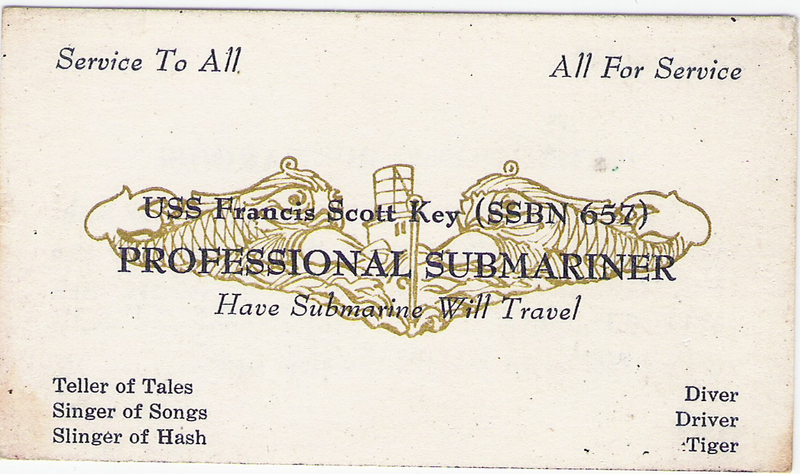 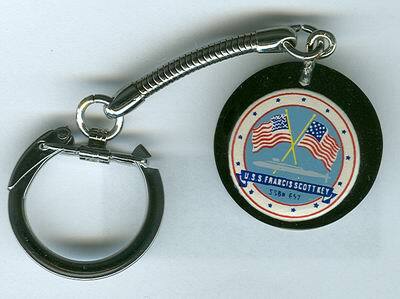 Transferred from the USS Greenfish (SS-351) at Pearl Harbor, Hawaii. 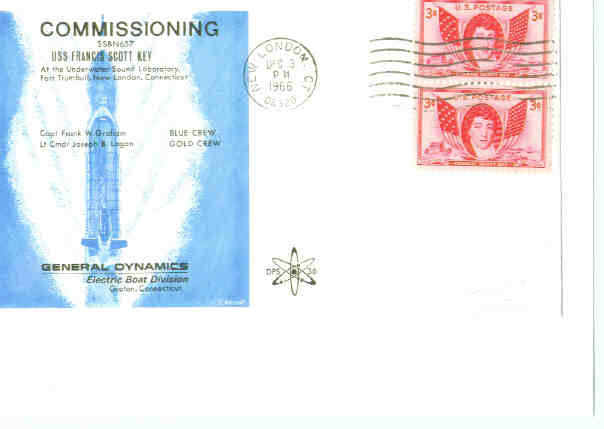 Reported @ 1610, 31 Dec. 1965 General Dynamics Corp. , Groton Conn Original to the Blue Crew, later during new construction assigned to the Gold Crew. 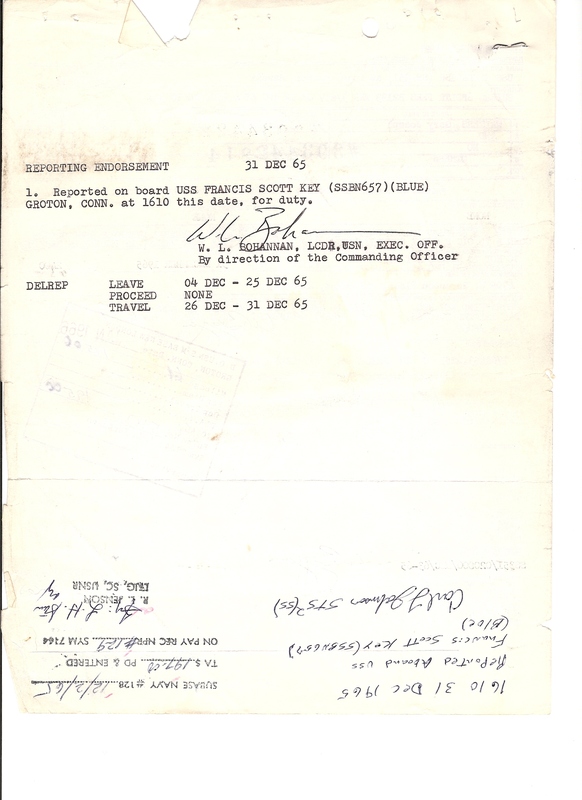 Note: I received $195.00 (0.06 per mile) Travel expense. 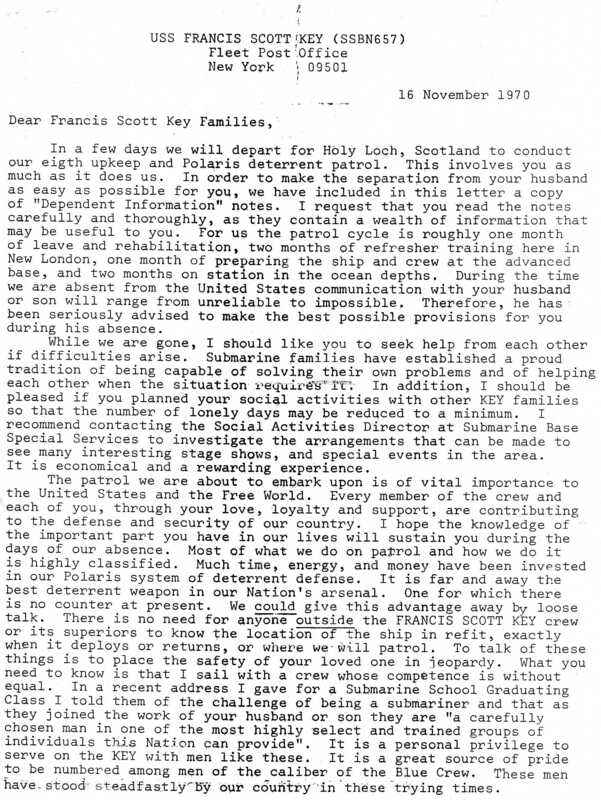 Gary Walters orders to the Key page 2. 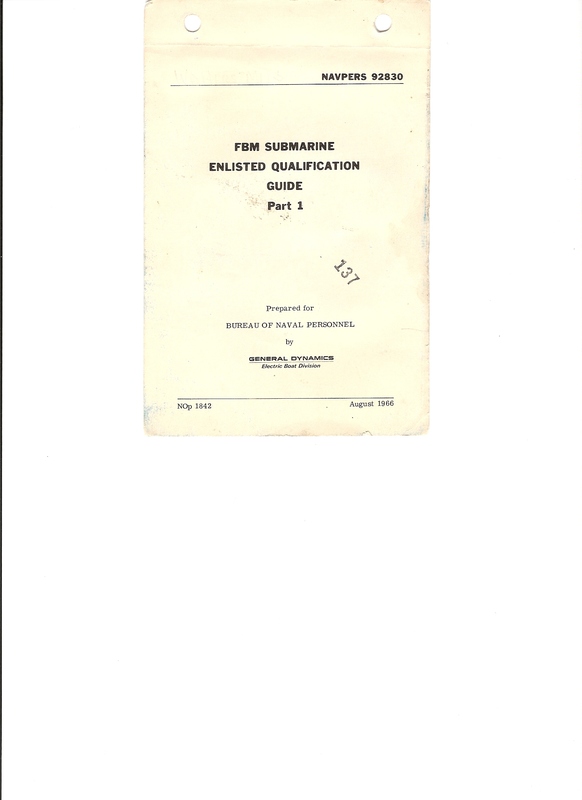 Gary Walters Qual Guide from 1966 typical page. 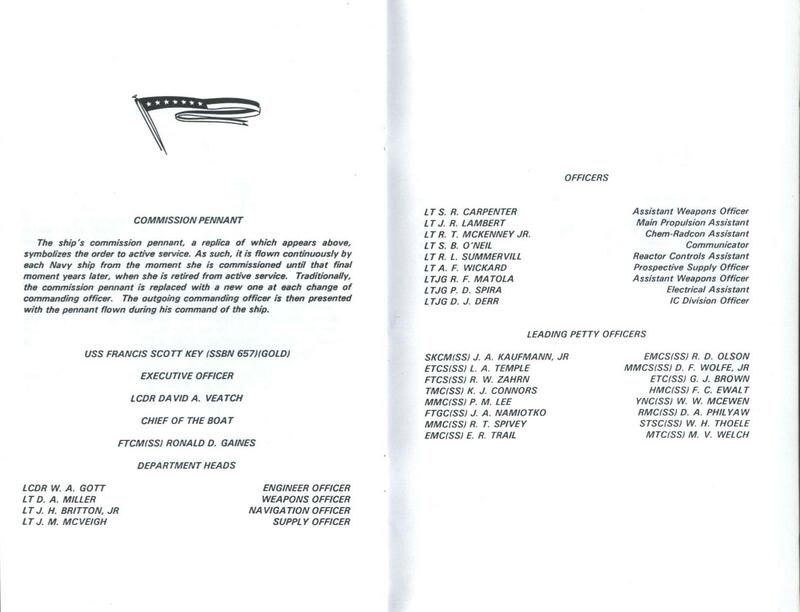 Joe Heflin's Commissioning booklet with tassel. 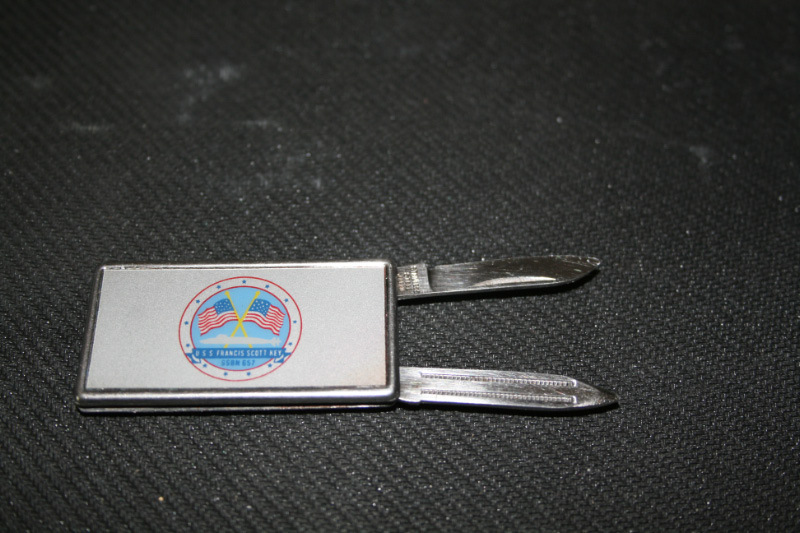 Joe Heflin's Key pocket knife/file. 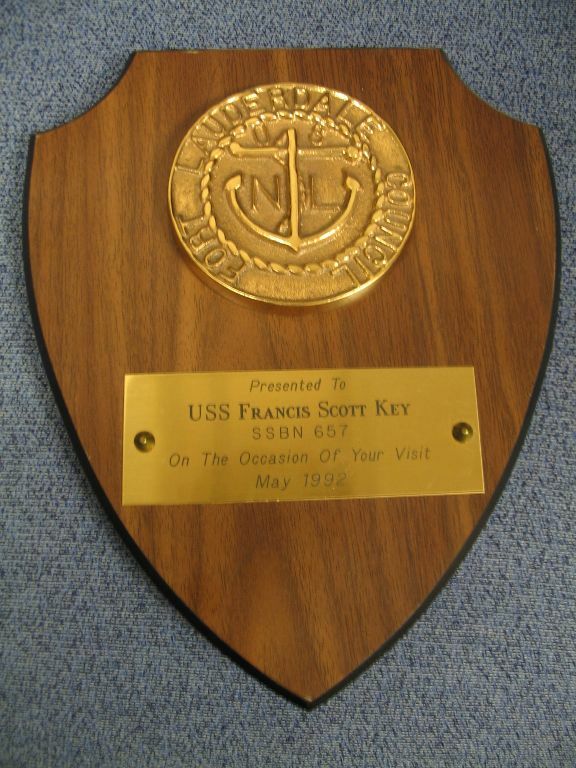 Last plaque awarded to the Key on her way to Hawaii. 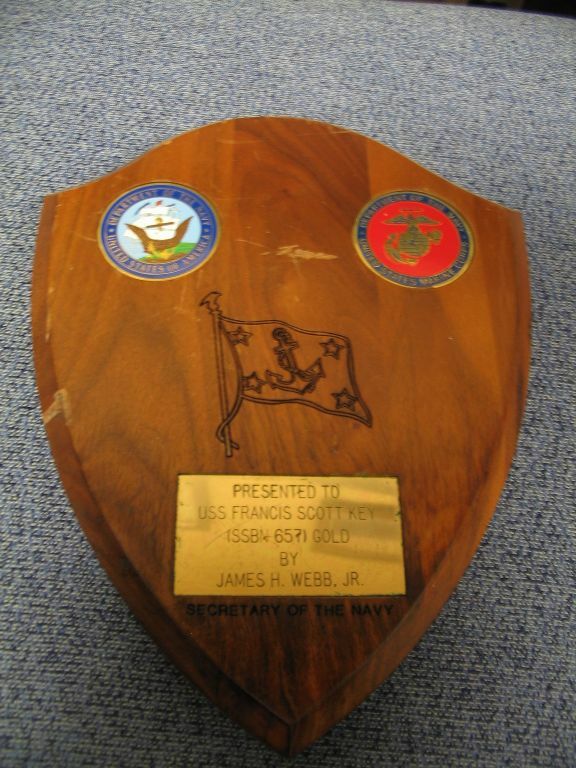 Found in trash during decommissioning. 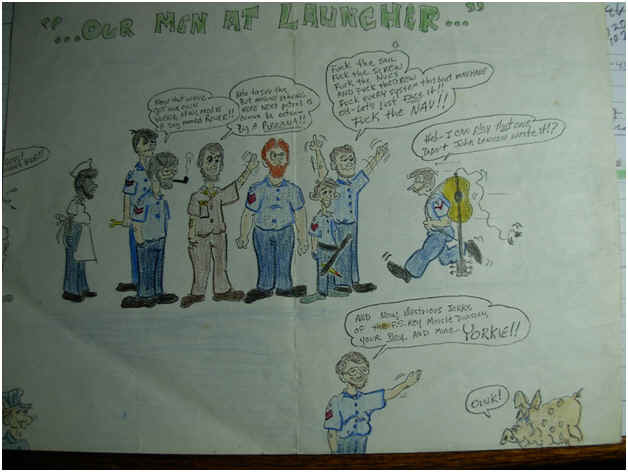 My name is Rick Stiger and I served on the 657 Blue Crew from 1972 until 1976. 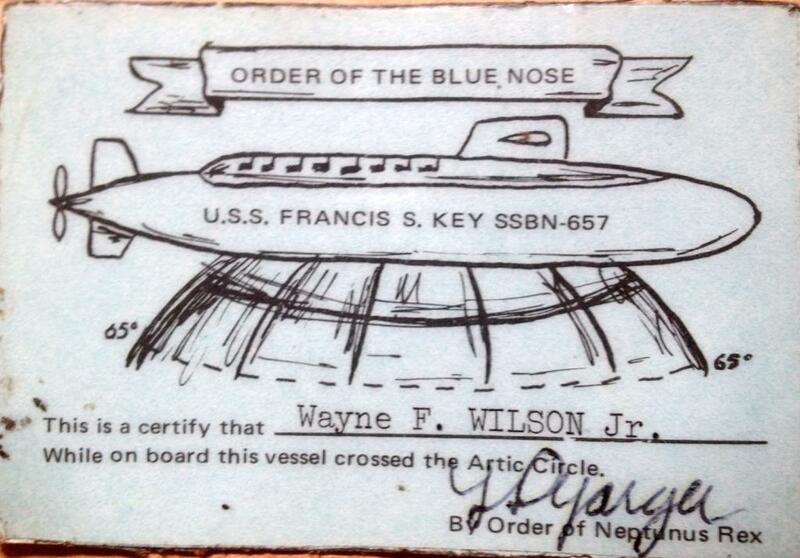 I picked up the boat in Bremerton Washington while she was in dry dock for missile conversion to Poseidon. 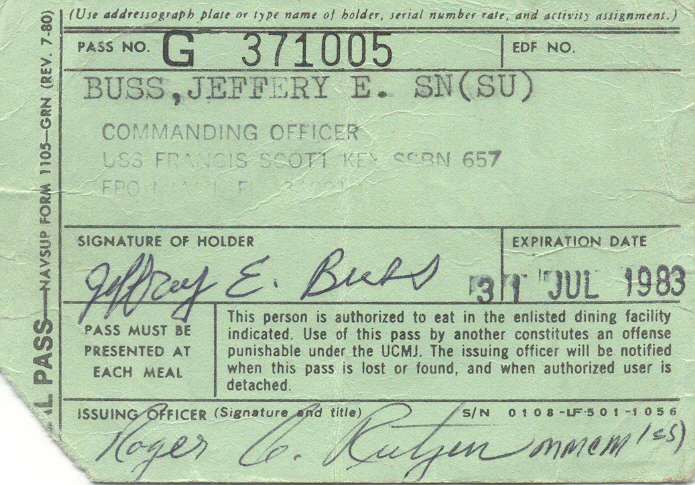 I was a mess cook for sea trials and the trip around to Charleston. 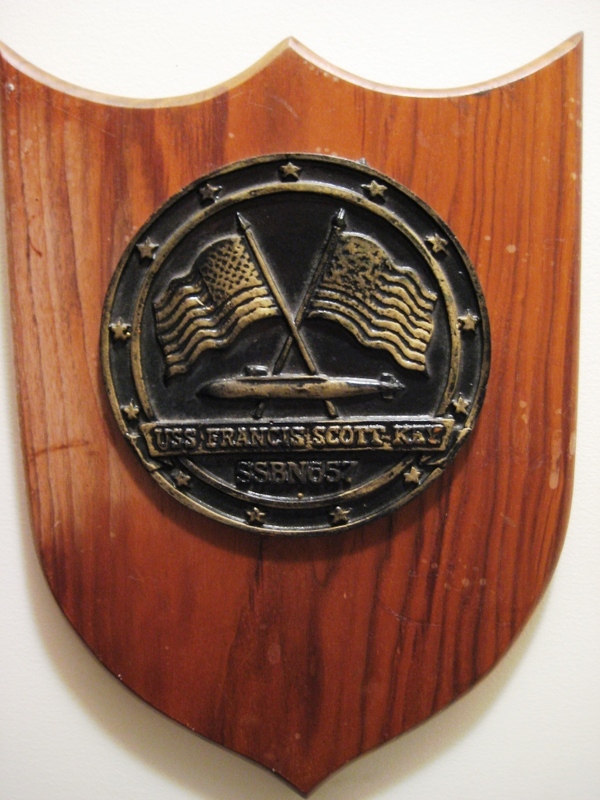 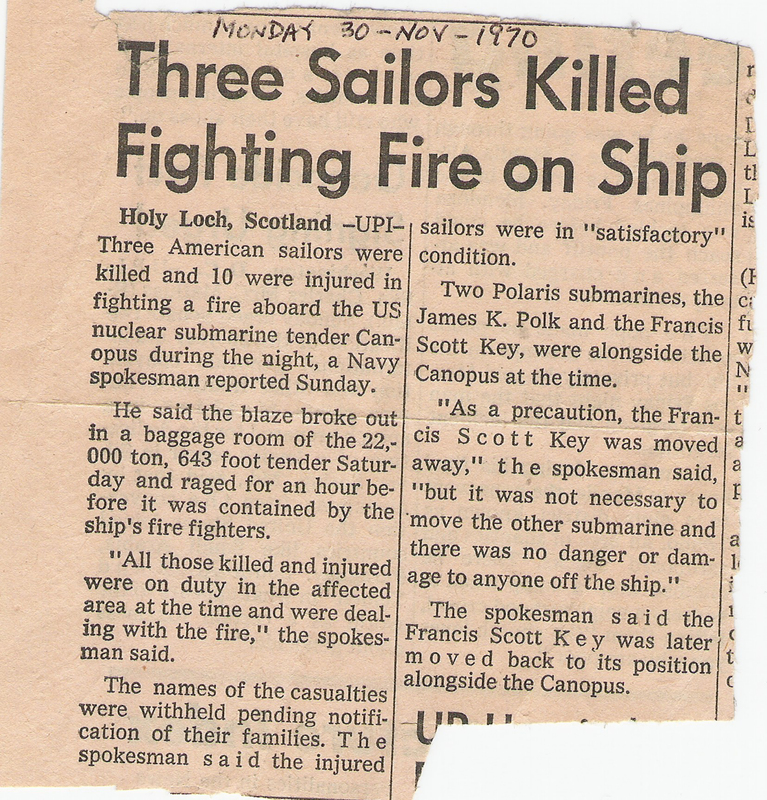 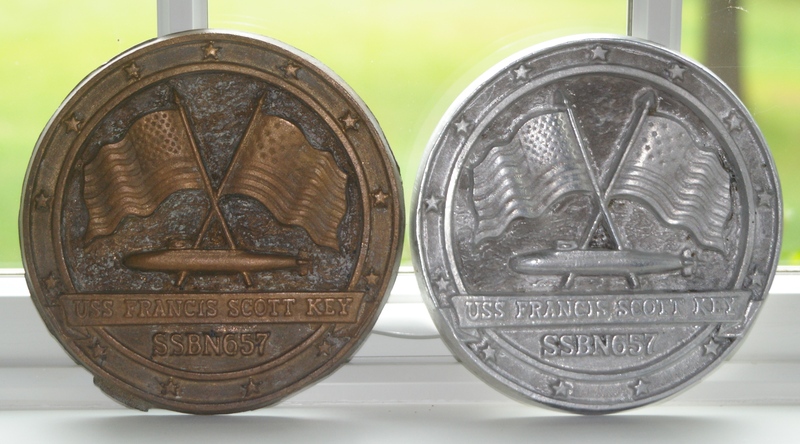 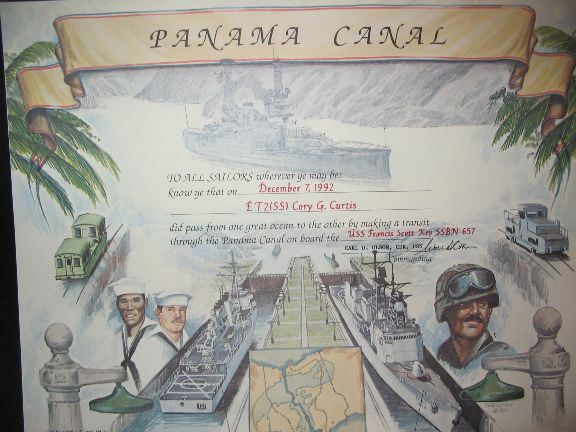 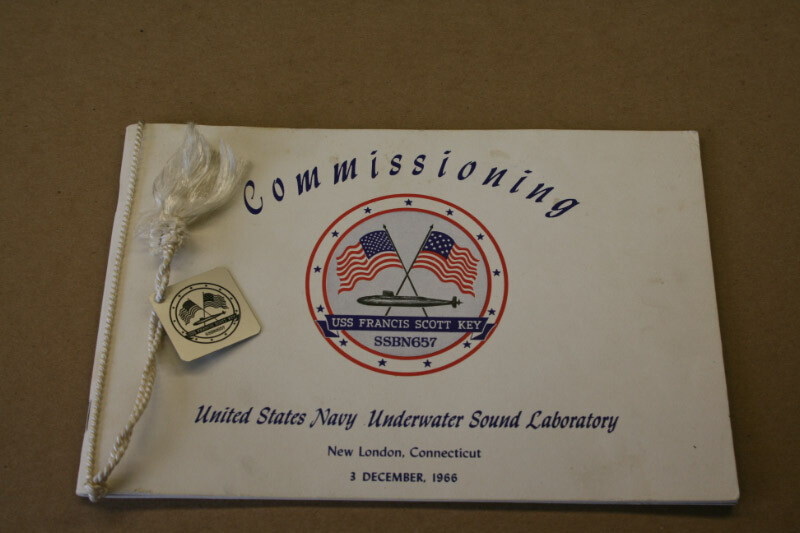 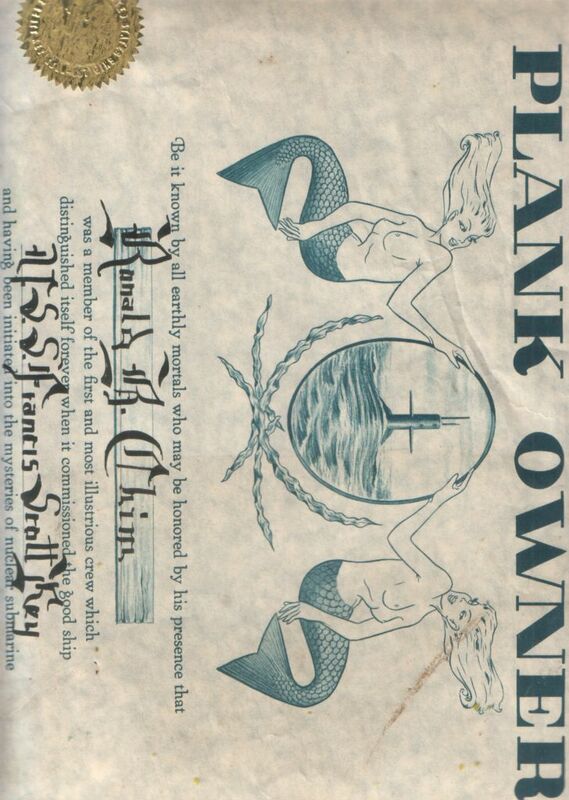 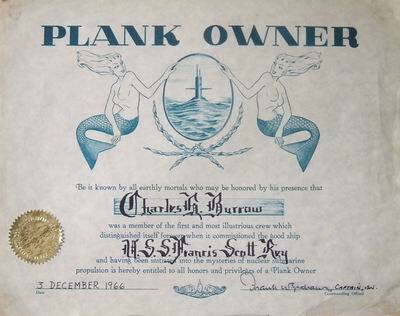 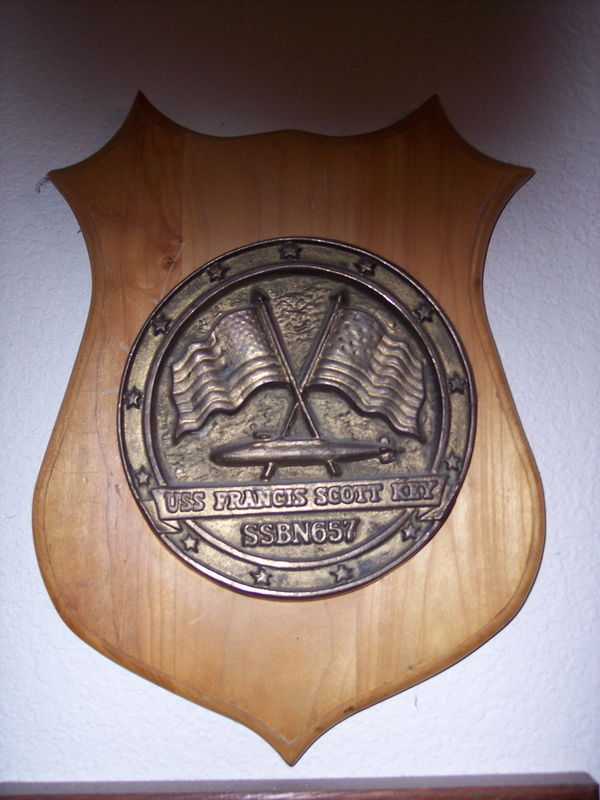 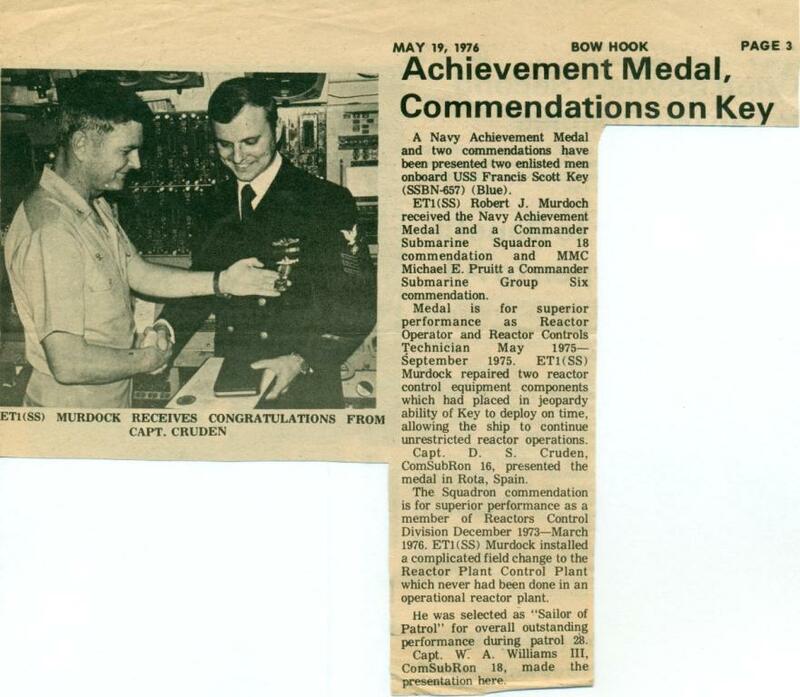 I remember making some copies of these plaques out of plaster of paris with some other grunts from the seaman gang. 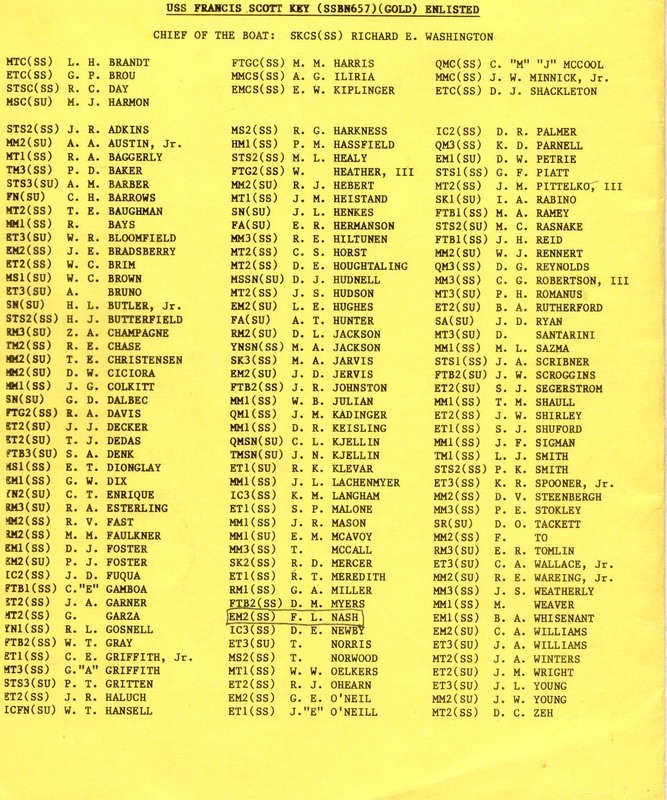 I do not remember why, but we made quiet a few of them. 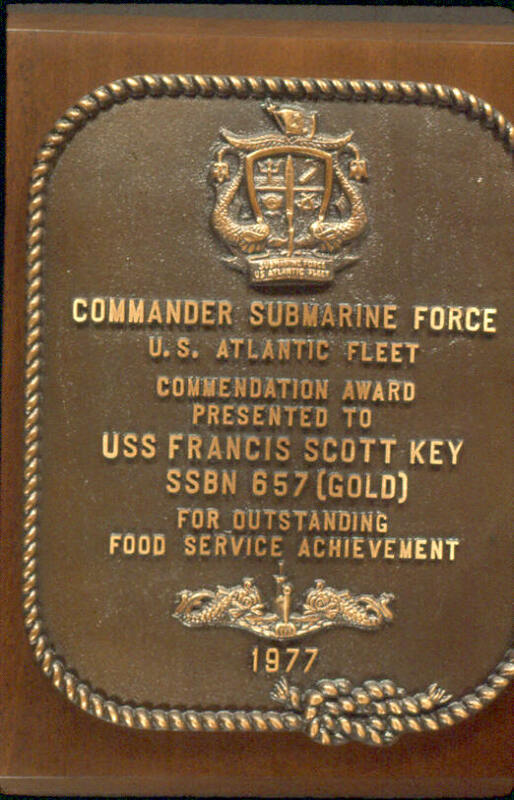 I ended up with one of the brass plaques not by any underhanded means but as a reward from the COB. 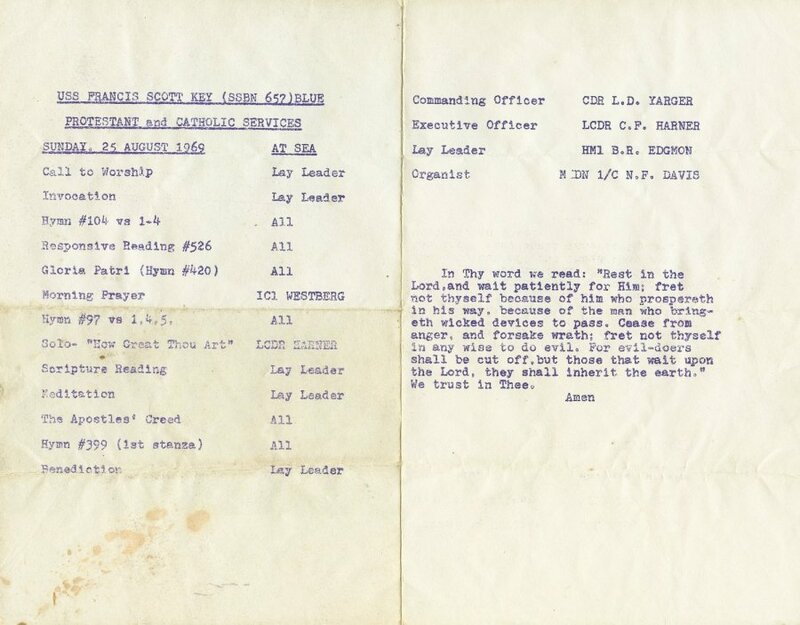 I made 5 patrols on the 657 before getting my discharge. 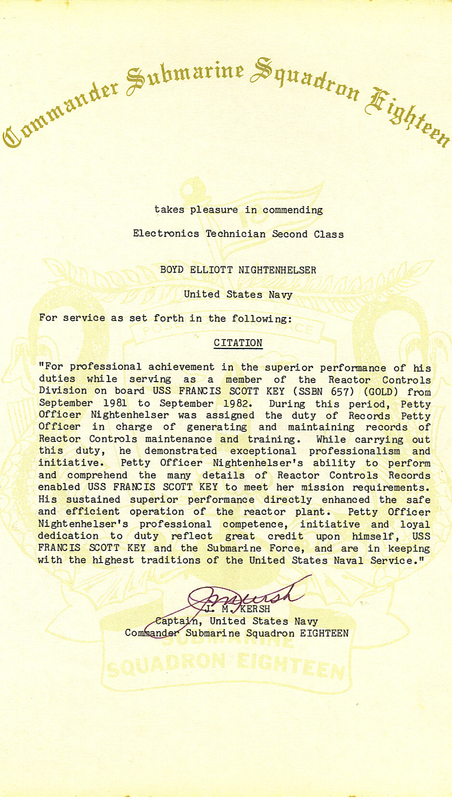 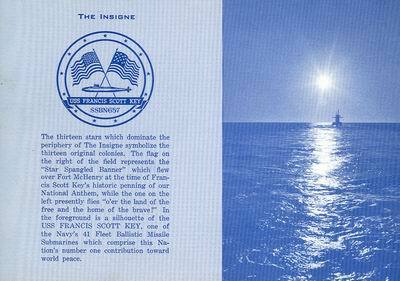 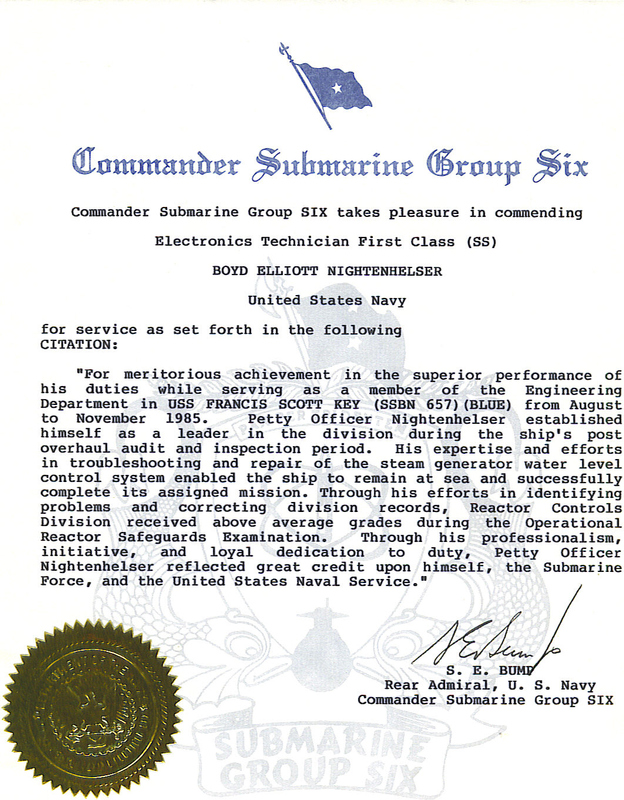 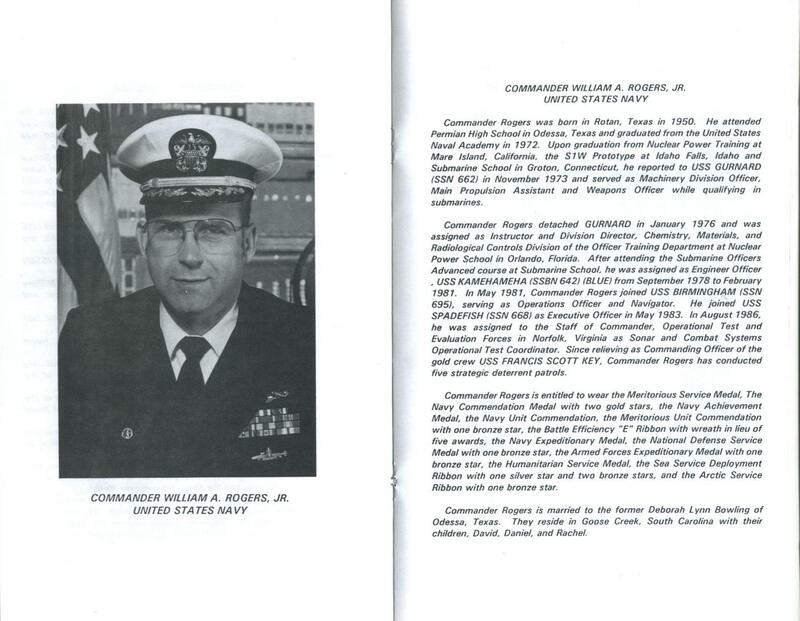 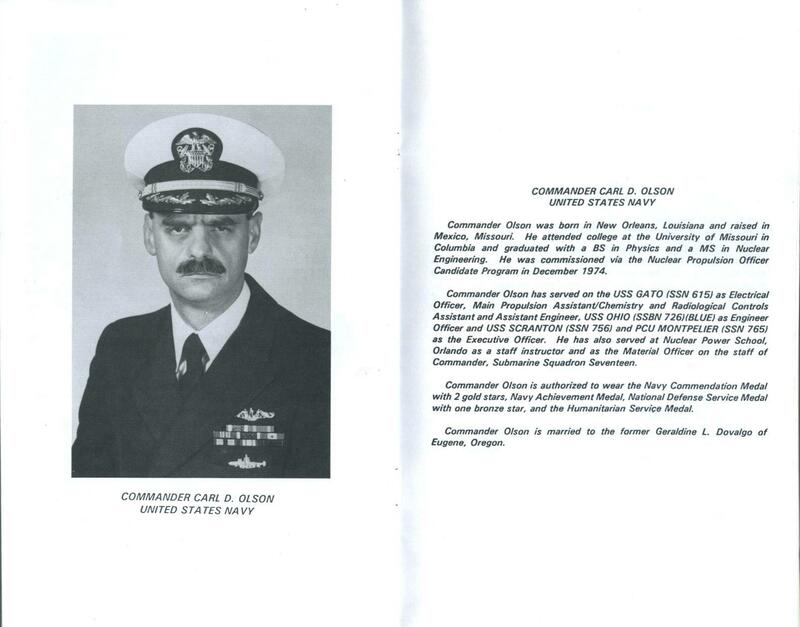 Boyd Nightenhelser Ship's Plaque given to him by CDR Ross when he got his dolphins. 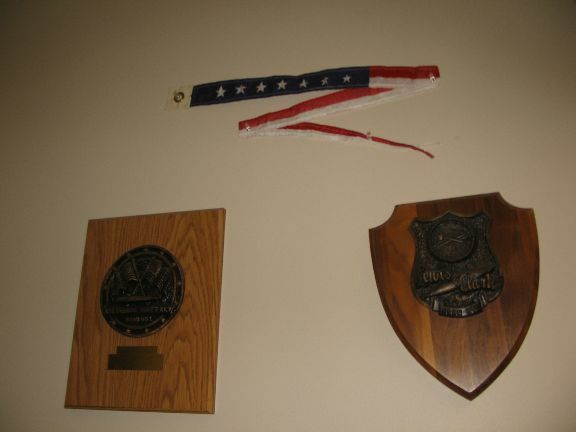 This plaque was probably made by Rick Stiger, see above story and picture of the master plaque. 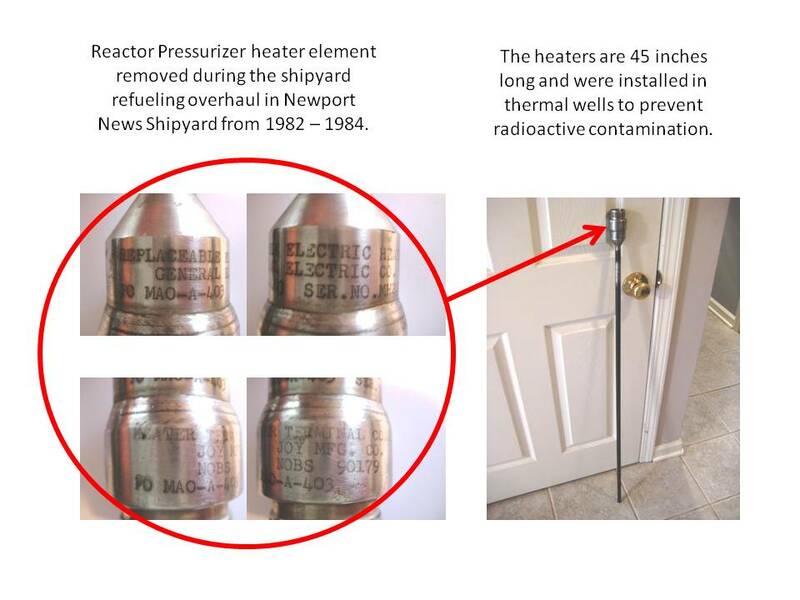 Attached is a picture collage of a Reactor Pressurizer heater element removed during the shipyard refueling overhaul in Newport News Shipyard from 1982 – 1984. 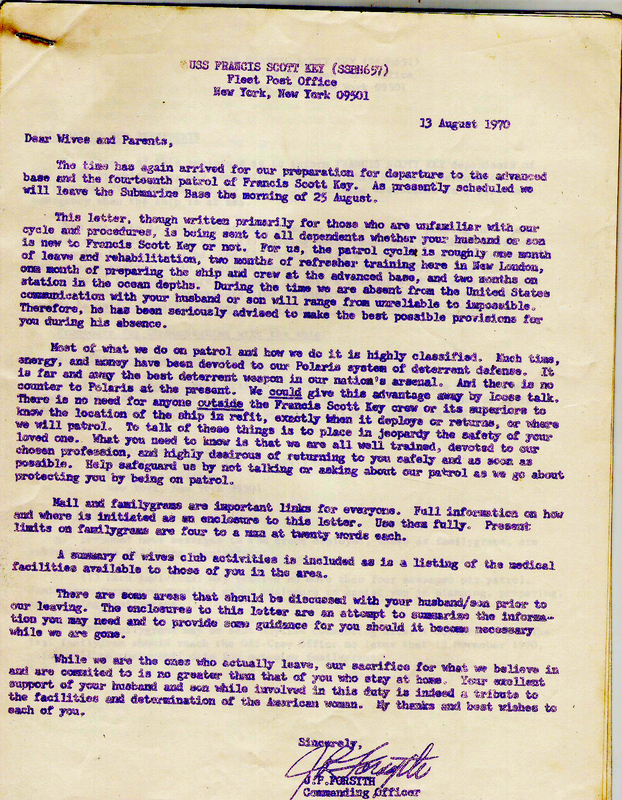 The heaters are 45 inches long and were installed in thermal wells to prevent radioactive contamination. 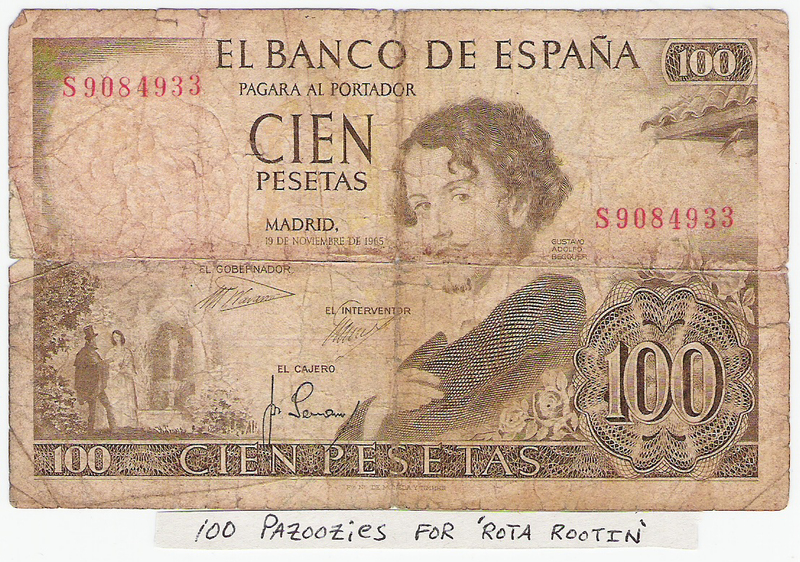 Spanish money from the 1970's used in Rota bars. 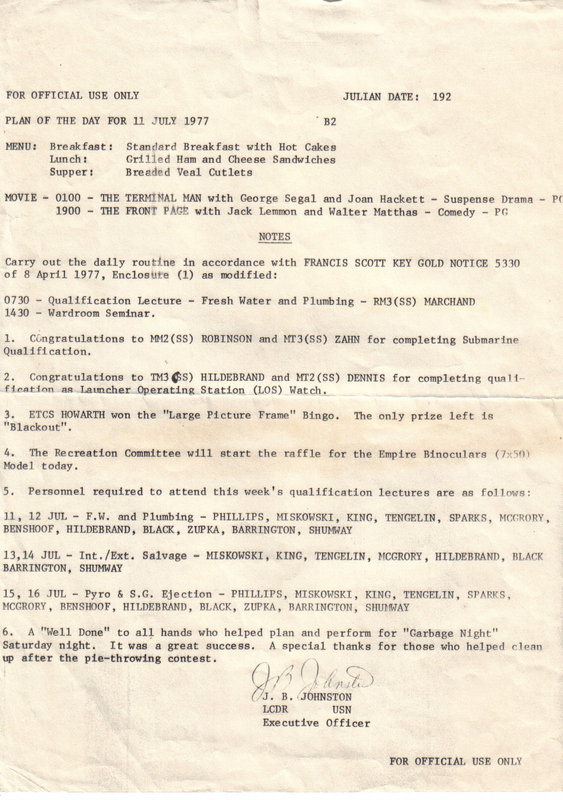 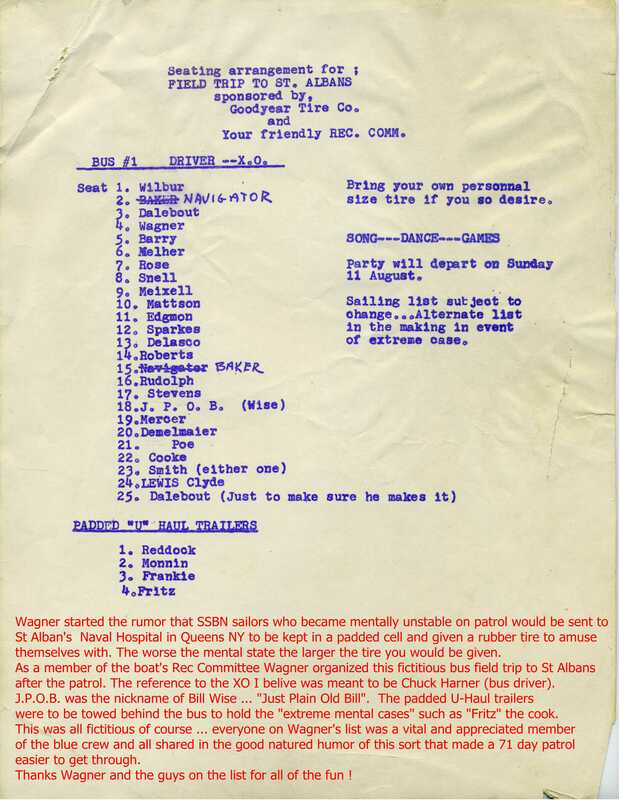 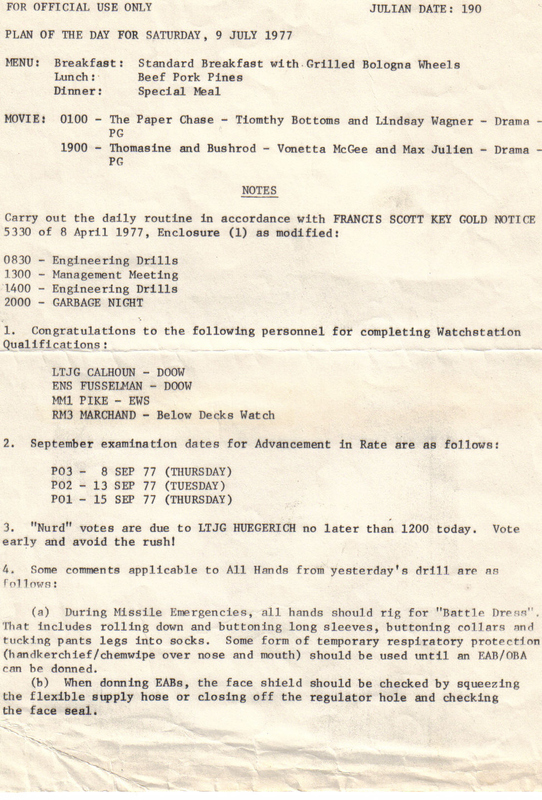 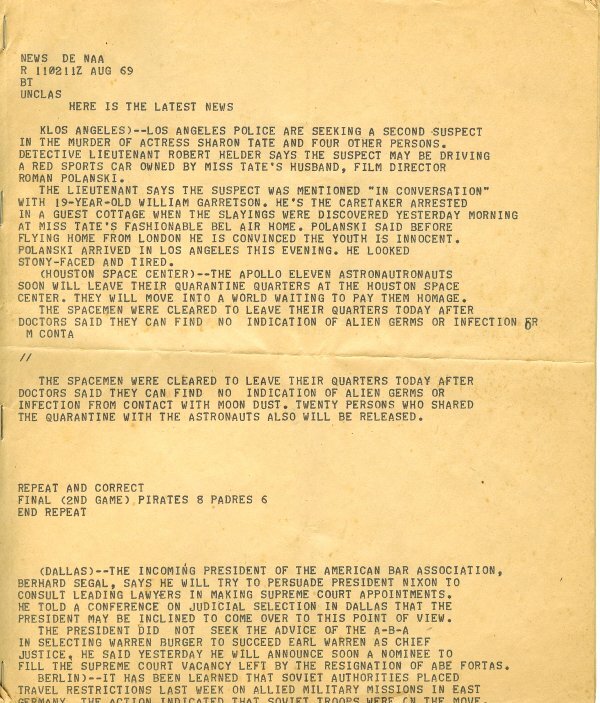 22 June 71 Blue Crew Plan of the Day. 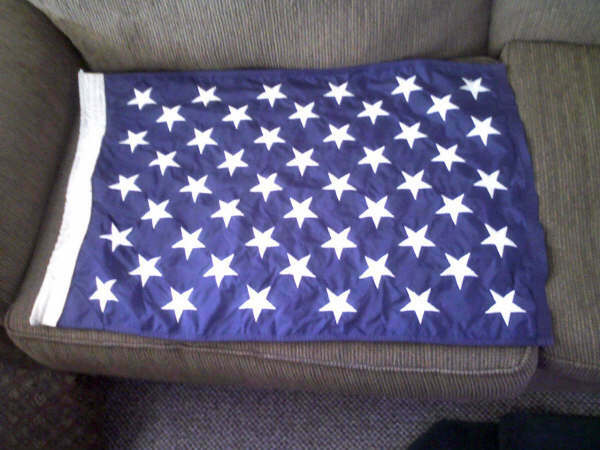 Submitted by Bil Hole. 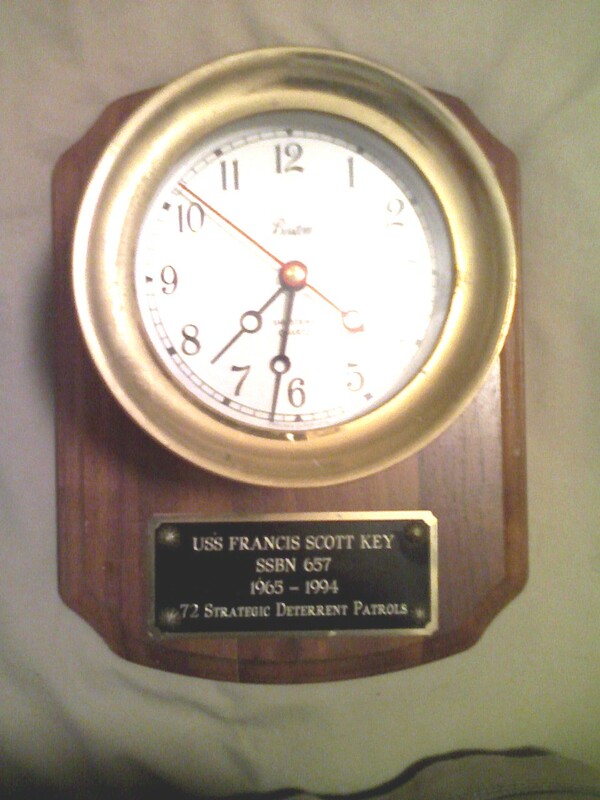 Clock from Captains stateroom saved by Ples Reynolds after decomm. 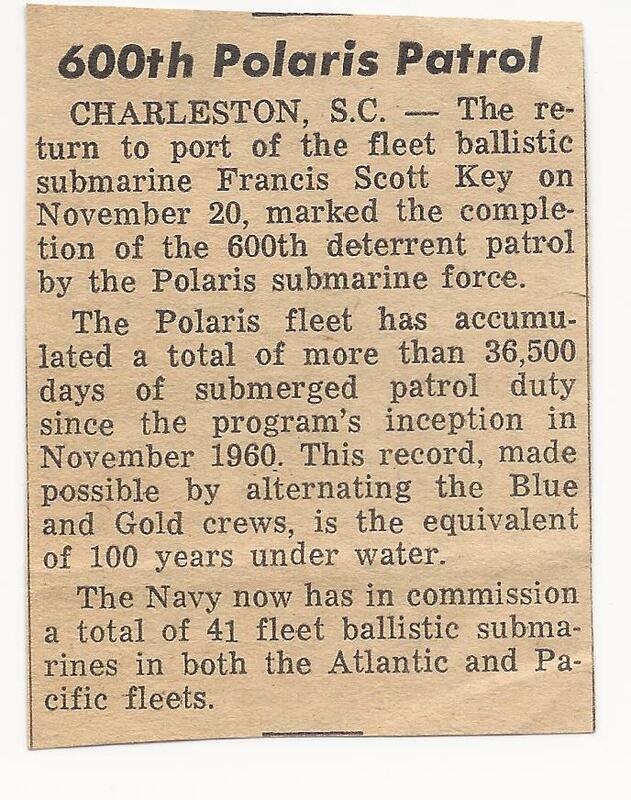 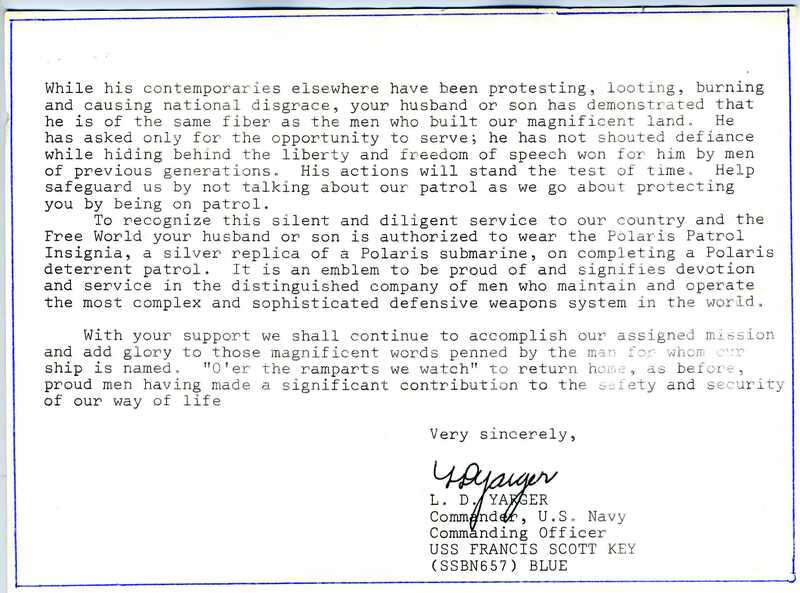 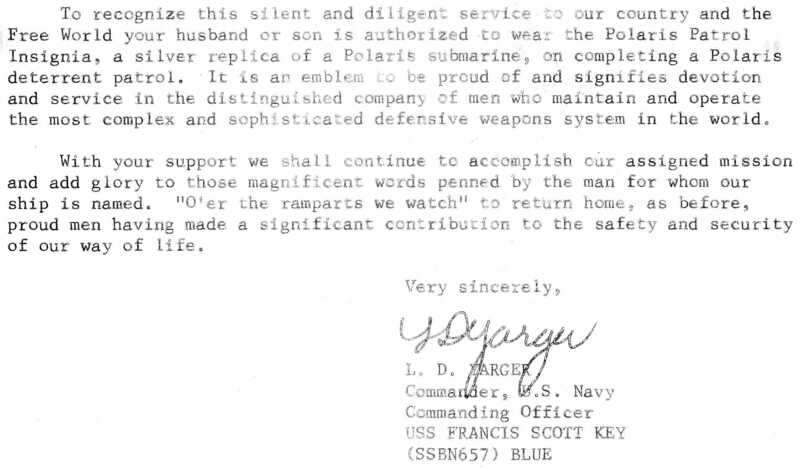 It says Key made 72 patrols. 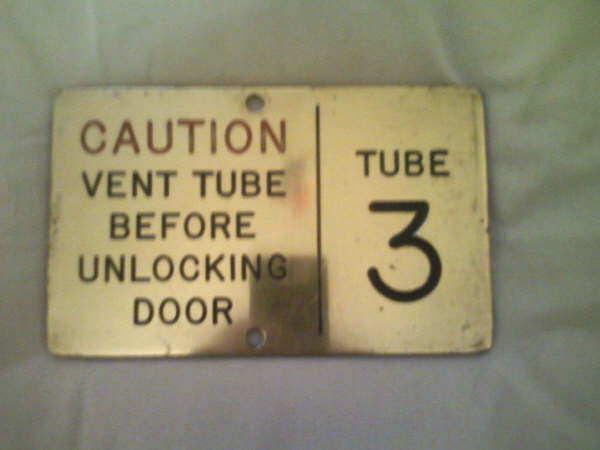 Missile tube 3 door plaque. 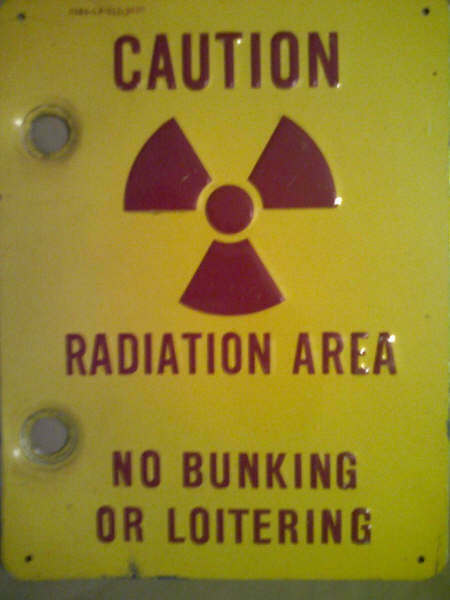 Didn't have this sign in the 70s. 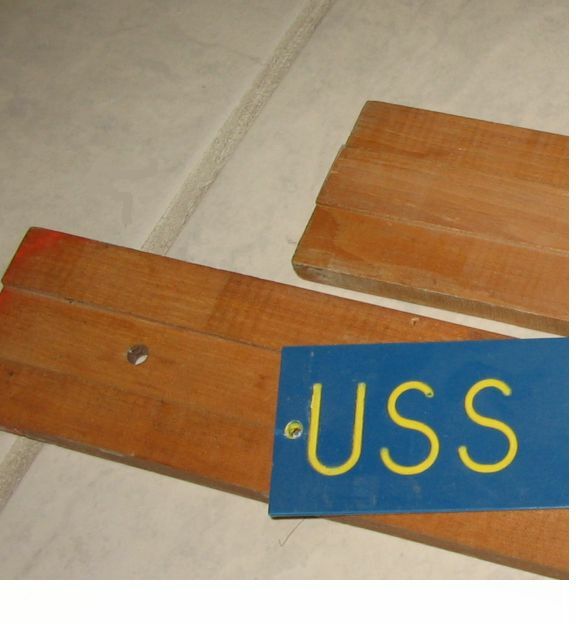 Union Jack Flag saved by Ples Reynolds after decomm. 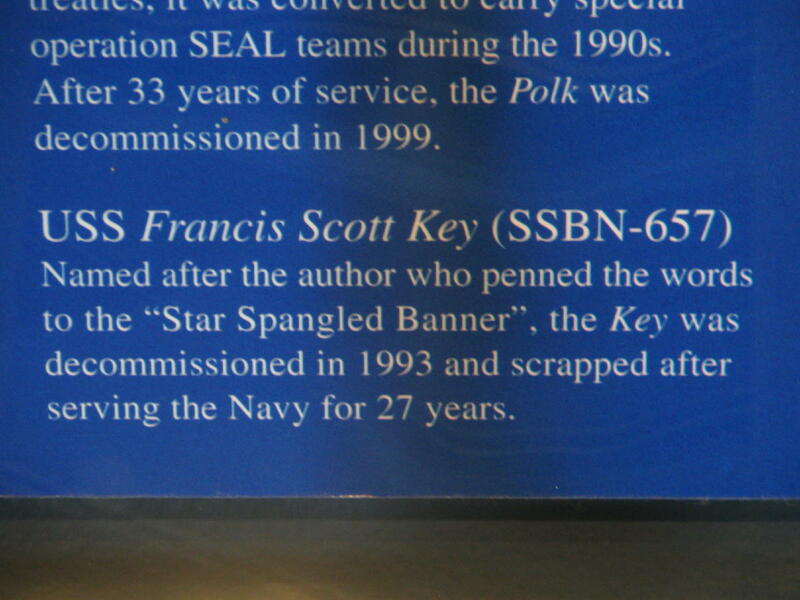 Ples donated this flag to the crew of the Key and it is displayed at each reunion. 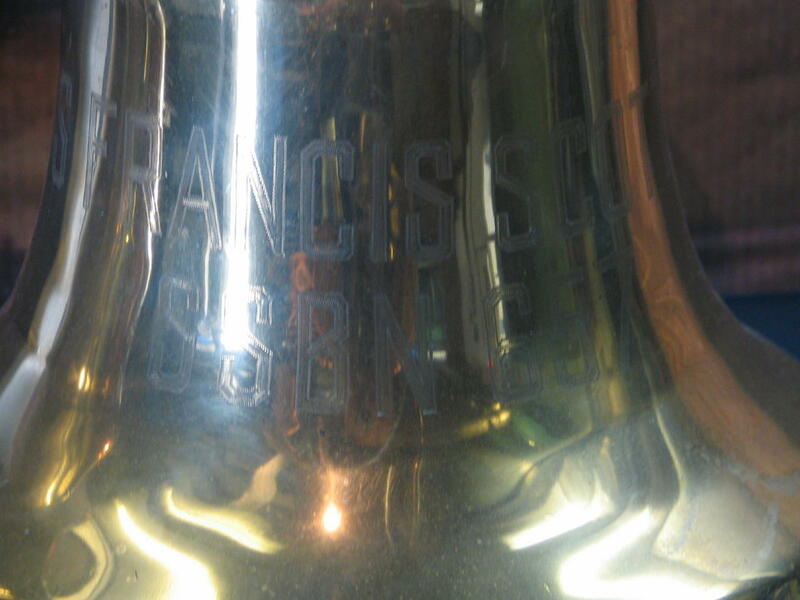 Tom Courtien sent in this picture of his Key Gold coffee cup from the 1970s. 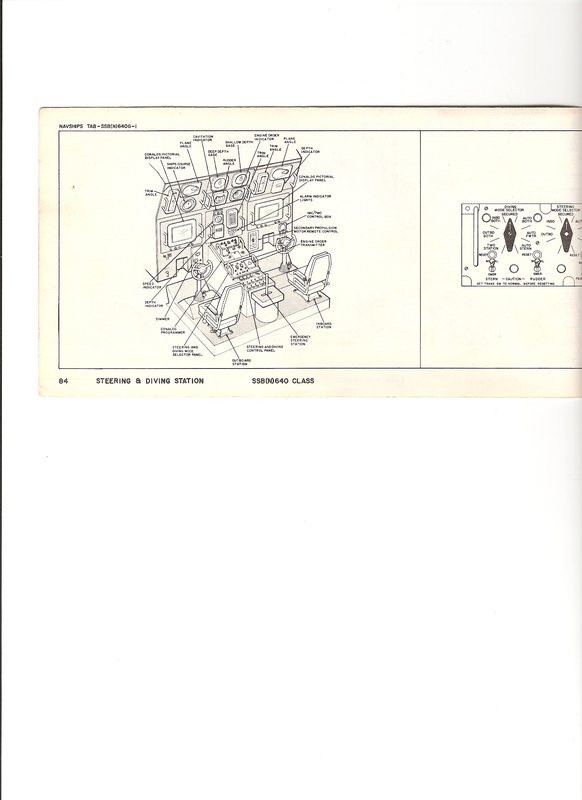 from 90-decom on blue/combined crew and while in decom the EAB system was turned off. 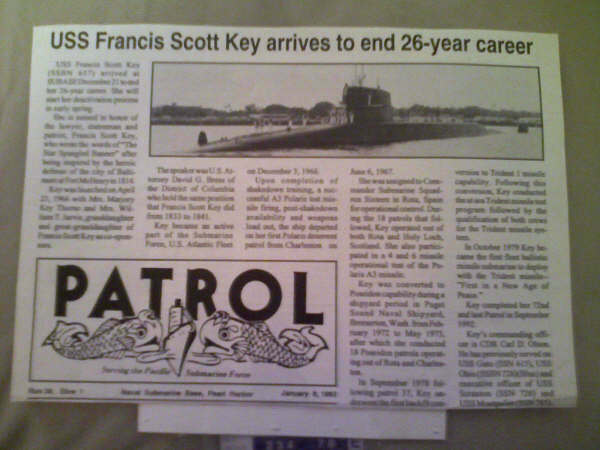 I turned one of the caps into a key chain and have had it ever since.